This compilation album of a-ha hits "Headlines And Deadlines" features 16 tracks including the song "Move To Memphis" which was recorded especially to be included on the album. The cover of the LP features a colour group-shot (Morten, Magne and PÂl) by Just Loomis. The a-ha logo is printed in beige in the bottom right corner with the title in blue and white underneath. 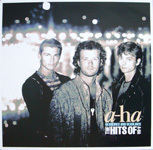 The reverse is black with an a-ha picture in the corner as on the "Move To Memphis" single. The German made CD has similar cover to the LP. 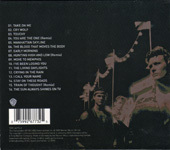 The 6 page CD booklet features pictures used on the packaging of the different single releases on a black background. Further all text is written in beige, white, cream and blue lettering. 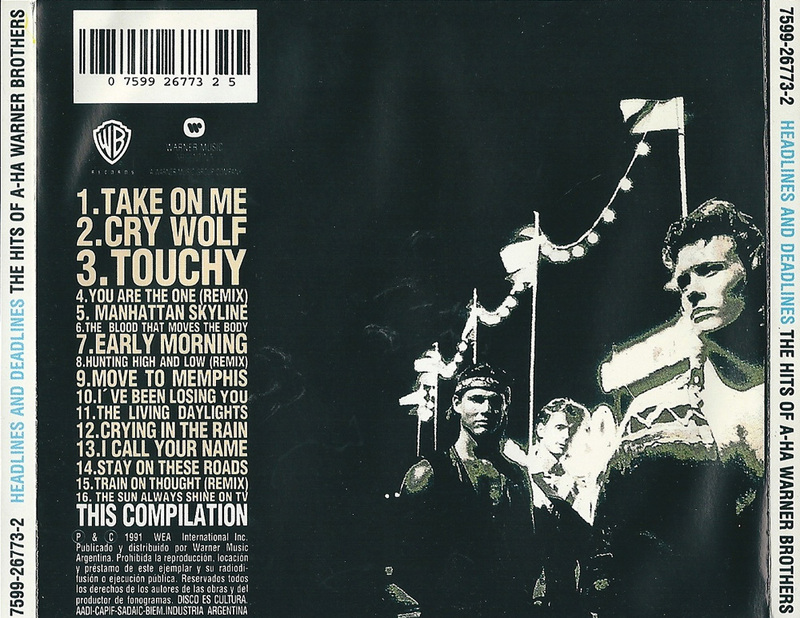 The reverse of the CD booklet and back insert feature a black and white with green and pink tinge group-shot (as found on the "Move To Memphis" single cover). The back insert also features a beige track listing and other white text including the catalogue number "7599-26773-2 FRANCE WE 852". 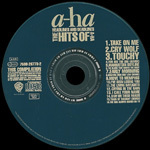 The CD itself is navy blue with titles and a-ha-logo in a golden beige. Note that there is no silver rim to the disc as with some of the other issues. There were various different pressings of this album and available in parts of Europe (some of which were also available in the UK), see "European" releases below for details. The German made cassette has cover similar to the LP and CD. The sleeve fold out. One side has a black background with seven black and white band shots and white text. The other side also has a black background but there are ten group shots plus text in blue, white and beige. The spine of the sleeve is black with blue, white and beige text. The actual cassette is transparent / grey with white titles. 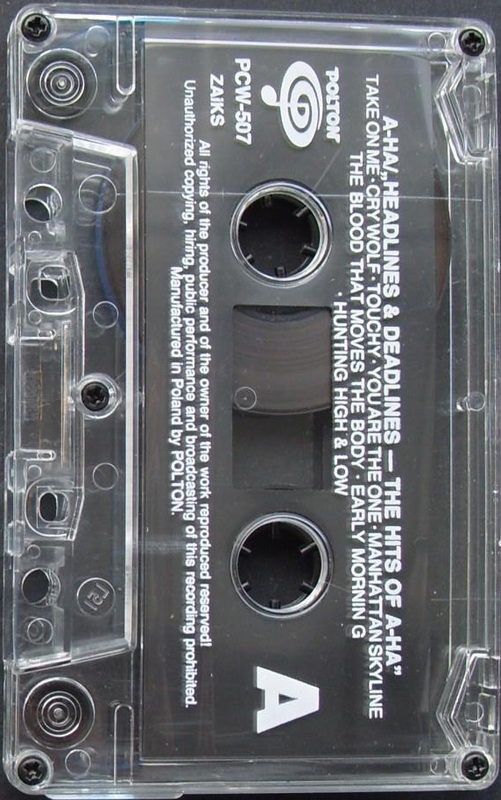 There was a "Tape Tape" promo cassette produced for "Headlines And Deadline". It comes in a white paper sleeve with the tracks printed in typewriter-face on the front. It is labelled as "The Best of a-ha". Two tracks are missing compared to the regular release "Early Morning" and "Train Of Thought (Remix)". The cassette itself is a regular audio cassette with typed on sticker along the top. In December 2002, "Headlines And Deadlines" was re-released in the UK. It has the same catalogue number as previous, but comes in a special brown coloured card slip case featuring a recent band shot (Paul, Morten, Magne). On the back of the slipcase it displays the full track listing printed in white text down the left hand side, the artworks used for the "Move to Memphis" single is also included. At the bottom left hand corner there is some Manufacturing and Copyright information which reads; "7599-26773-2 This Compilation (P) 1991 WEA International Inc. (C) 2002 Warner Music UK Ltd. The copyright in this sound recording and artwork is owned by WEA International Inc. A Time Warner Company. Made in Germany by (w) Warner Music manufacturing Europe. Unauthorised copying, hiring, lending, public performance or broadcasting of this record prohibited. LC 0392". Included inside the slipcase is the re-issued European CD album which comes with the Catalogue Number "7599-26773-2 WE 835", matrix 759926773-2.3 06/99 (see "European" releases below). 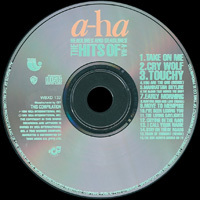 The disc has a silver rim to it and the text on the disc is more cream in colour with the size of the track listing down the right hand side smaller than on the original issue. Tracks (LP): Take On Me (3:48) / Cry Wolf (4:08) / Touchy! (4:38) / You Are The One (remix) (3:47) / Manhattan Skyline (4:51) / The Blood That Moves The Body (4:06) // Hunting High And Low (remix) (3:48) / Move To Memphis (4:18) / I've Been Losing You (4:26) / The Living Daylights (4:17) / Crying In The Rain (4:24) / I Call Your Name (4:53) / Stay On These Roads (4:47) / The Sun Always Shines On T.V. (5:05). Tracks (Cassette): Take On Me (3:48) / Cry Wolf (4:08) / Touchy! (4:38) / You Are The One (remix) (3:47) / Manhattan Skyline (4:51) / The Blood That Moves The Body (4:06) / Early Morning (2:59) / Hunting High And Low (remix) (3:48) // Move To Memphis (4:18) / I've Been Losing You (4:26) / The Living Daylights (4:17) / Crying In The Rain (4:24) / I Call Your Name (4:53) / Stay On These Roads (4:47) / Train Of Thought (remix) (4:17) / The Sun Always Shines On T.V. (5:05). Tracks (CD): Take On Me (3:48) / Cry Wolf (4:08) / Touchy! (4:38) / You Are The One (remix) (3:47) / Manhattan Skyline (4:51) / The Blood That Moves The Body (4:06) / Early Morning (2:59) / Hunting High And Low (remix) (3:48) / Move To Memphis (4:18) / I've Been Losing You (4:26) / The Living Daylights (4:17) / Crying In The Rain (4:24) / I Call Your Name (4:53) / Stay On These Roads (4:47) / Train Of Thought (remix) (4:17) / The Sun Always Shines On T.V. (5:05). The first Argentine CD release of Headlines and Deadlines comes with a navy disc with beige text, it is similar to the European release. The booklet is also the same as the EU release. There is a silver "FLAPF" hologram sticker on the front of the CD case. On the back cover the layout and design is again very similar to the European release but it additionally displays the "WARNER MUSIC ARGENTINA" logo at the top underneath the barcode. At the bottom left hand corner of the back cover and on the actual disc itself, we have some different Manufacturing and Copyright information which is printed in Spanish, it reads "(P) & (C) 1991 WEA International Inc. Publicado y distribuido por Warner Music Argentina. Prohibida la reproduccion, locacion y prestamo de este ejemplar y su radiodifusion o ejecucion publica. Reservados todos los derechos de los autores de las obras y del productor de fonogramas. DISCO ES CULTURA. AADI-CAPIF-SADAIC-BIEM.INDUSTRIA ARGENTINA". 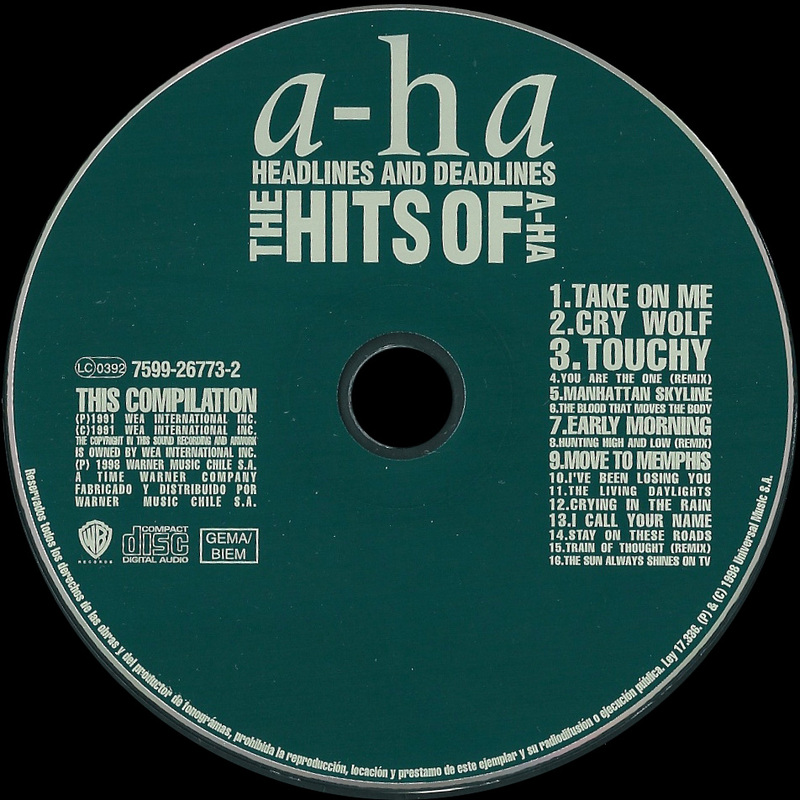 The second Argentine CD release of "Headlines and Deadlines" comes instead with a black disc with grey text rather than the usual blue one with beige text. The front and back cover is exactly the same as the first pressing. The same booklet is also included. There is a "ifpi" silver hologram sticker on the front of the CD case. 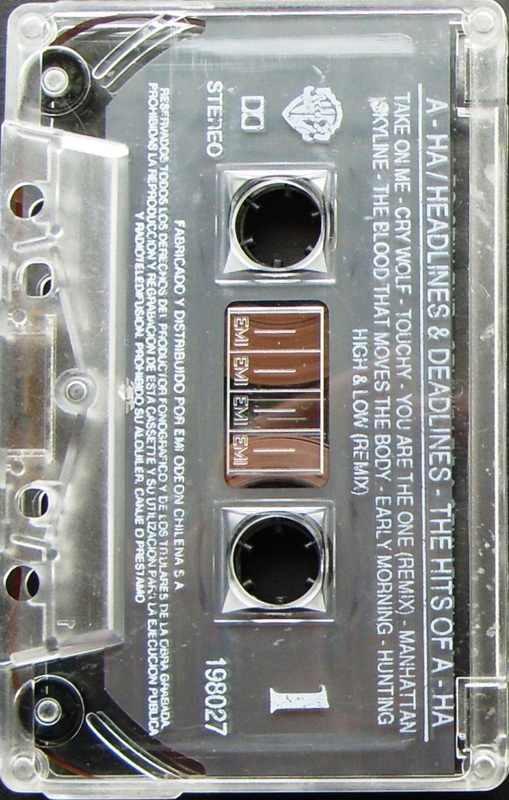 The Argentine cassette release of "Headlines and Deadlines" comes with "LO MEJOR" printed in white at the beginning of the title on the front cover, the remainder of the text inside of the folded insert is displayed all in Spanish. The track listing on the back sleeve has been printed in yellow instead of the usual beige. The first pressing was made by "EMSSA" and comes without a white barcode on the back sleeve. The Catalogue number on the front cover, spine and tape is 4-26773. The "Warner Brothers Records" and "Warner Music Argentina" logos are also displayed on the front cover. There is some Spanish Copyright and "DOLBY-NR" information on the inside of the folded insert on side 2 above the artworks for the "Move to Memphis" single, it reads "Prohibida la reproduccion, locacion y prestamo de este ejemplar y su radiodifusion o ejecucion publica. Reservados todos los derechos de los autores de las obras y del productor de fonogramas. INDUSTRIA ARGENTINA - MARCAS REGISTRADAS SADAIC-BIEM-AADI-CAPIF. Esta cinta fue grabada con la caracteristica Dolby Tipo B de reduccion de ruido Durante la reproduccion de la misma colocar el selector de Dolby NR del grabador en la posicion ON. De no contar con esta posibilidad, ajustar convenientemente el control de agudos". Also on side 2 underneath the track listing and credits, it displays the "WARNER MUSIC ARGENTINA" logo and "Una compania del grupo Time Warner". The tape itself is transparent clear with a grey centre piece and white printed text. 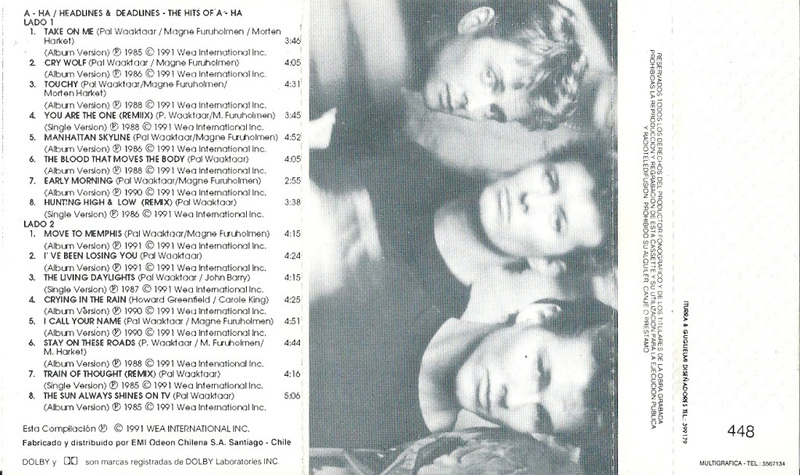 The title "LO MEJOR DE A-HA" is shown at the top with the Spanish track listing to each side underneath. The "Warner Brothers Records" and "Warner Music Argentina" logos are also displayed along with the text "INDUSTRIA ARGENTINA" and "SADAIC-BIEM AADI-CAPIF". The same Copyright information which appears on the inside of the folded insert is also displayed at the bottom of both sides. The second pressing comes without the Catalogue number and "Warner Brothers Records/Warner Music Argentina" logos on the front cover, it was also made by "EMSSA" and includes a white barcode on the back sleeve. On the spine the Catalogue number has been changed and now shows the full European Catalogue number 7599-26773-4, the "Warner Music Argentina" logo has also been printed much smaller compared to the first pressing and the "DOLBY-NR" logo has been omitted. 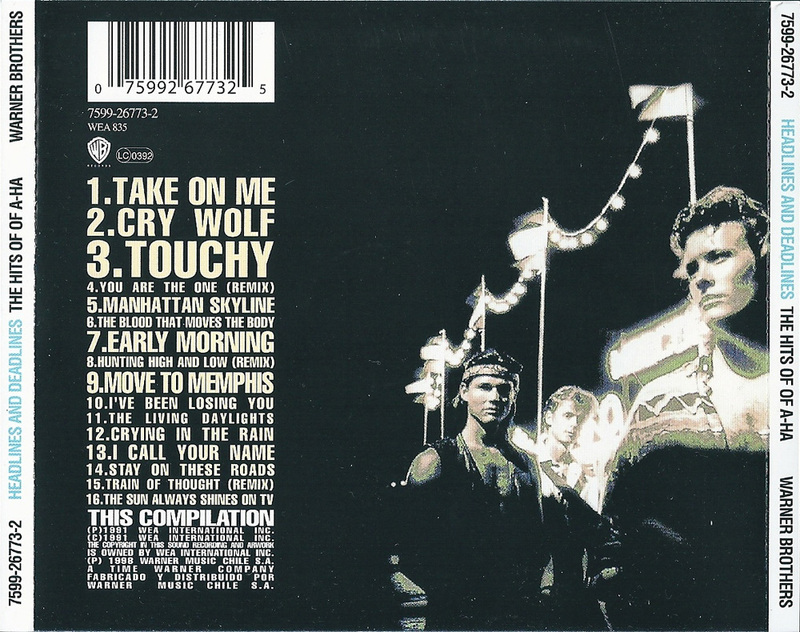 On the inside of the folded insert on side 2 above the artworks for the "Move to Memphis" single, the exact same Spanish Copyright and "DOLBY-NR" information is shown but has been displayed differently compared to the first pressing. Also on side 2 again underneath the track listing and credits, it displays "WARNER MUSIC ARGENTINA" but the logo is smaller, it also shows some different text "A WARNER MUSIC GROUP COMPANY" and "DISCO ES CULTURA" which didn't appear on the first pressing. The tape is white with brown printed text, the layout and design is exactly the same as the earlier transparent clear tape including using the same original Catalogue number 4-26773. The Australia CD release of "Headlines and Deadlines" has the same catalogue number as the regular European release but it is printed in one long number as 7599267732, without any dashes. The bar code number on the Australian Release is 9 325583 038839, different from the catalogue number. 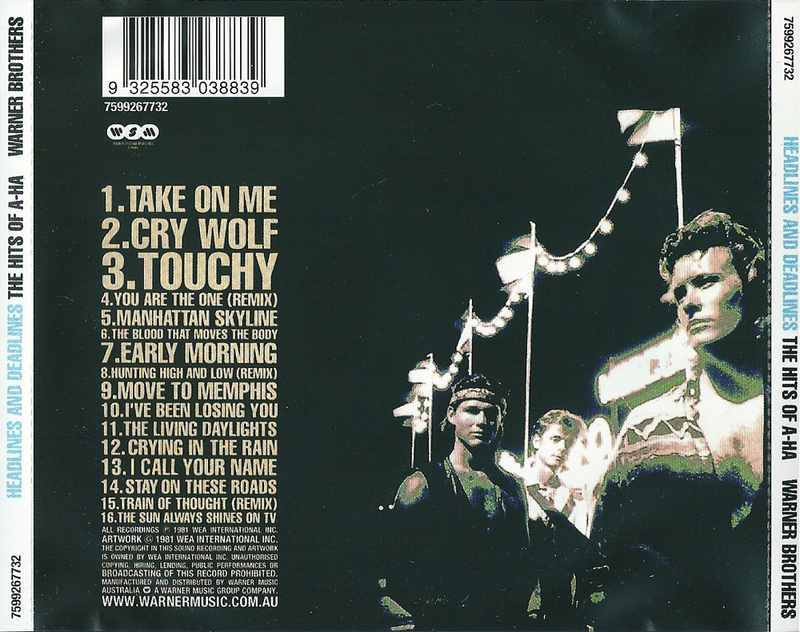 The back cover states that the album was "MANUFACTURED AND DISTRIBUTED BY WARNER MUSIC AUSTRALIA" and displays the "WWW.WARNERMUSIC.COM.AU" Website address. The CD itself is silver with black text, rather than blue. 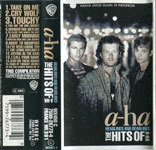 The Australian cassette was "Manufactured & distributed by Warner Music Australia Pty Limited", it comes with an extended folded insert to include a much larger back cover. All of the text throughout the insert is printed in white instead of the three usual colours. 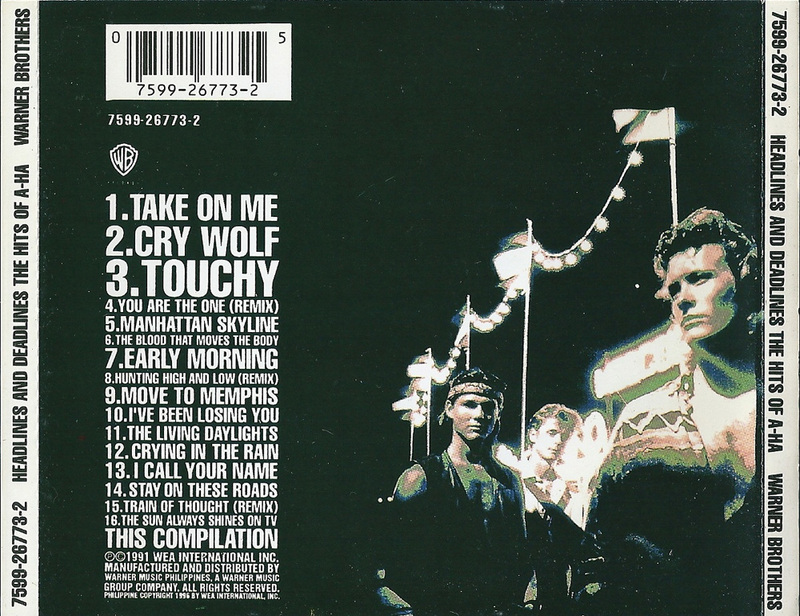 On the back cover the layout and font size is different compared to the European release, it displays the full track listing at the top with a larger white barcode at the bottom, there is also some additional Publishing text which reads "Publishers Side 1 tracks 1, 2, 3, 4, 5, 6, 8 MCA Music: 7 Warner Chappell. Side 2 tracks 1, 5 Warner Chappell: 2, 6, 7, 8 MCA Music: 3 MCA Music/Control: 4 Control. This compilation (P)(C) 1991 Warner Music International by WEA International Inc. A Time Warner Company". Also displayed at the bottom of the back cover under the Barcode is the Manufacturing and Distributing information, along with some additional "Dolby-B" text. Printed down the right hand side of the back cover is "CAUTION: BEFORE PLAYING ENSURE TAPE IS FULLY WOUND AND FREE FROM LOOPING". The tape is transparent clear with a grey centre and white printed text. 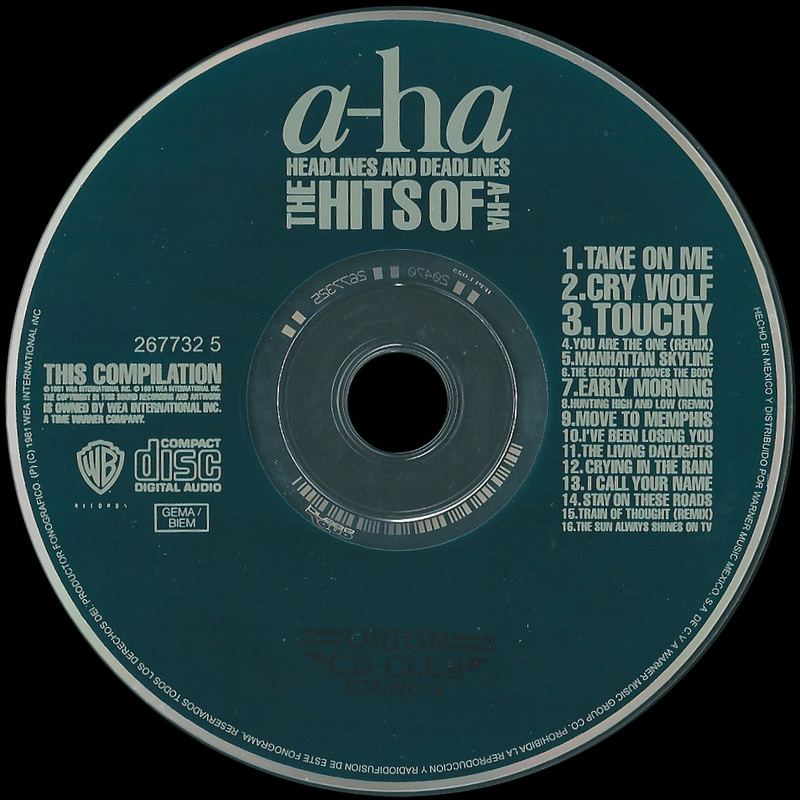 The full track listing to each side is displayed at the top and the title "HEADLINES & DEADLINES - THE HITS OF A-HA" is shown at the bottom. The "Manufacturing and distributed by Warner Music Australia Pty Limited. 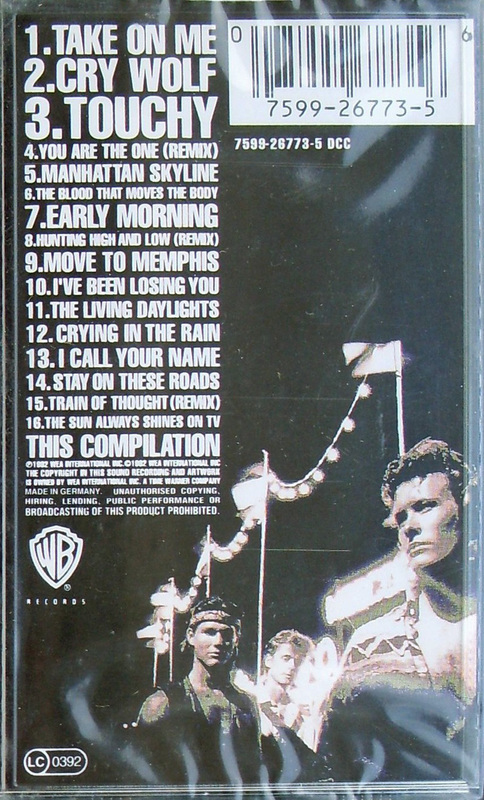 A Time Warner Company" is additionally shown on side 1, whilst on side 2 there is some production information "(P) 1985, 86, 87, 88, 90, 91 WARNER MUSIC INTERNATIONAL INC. (C) 1991 This compilation Warner Music International Inc - All rights reserved". The "WB Records" logo, "Dolby-B" logo and Catalogue number 7599267734 are also displayed on each side. 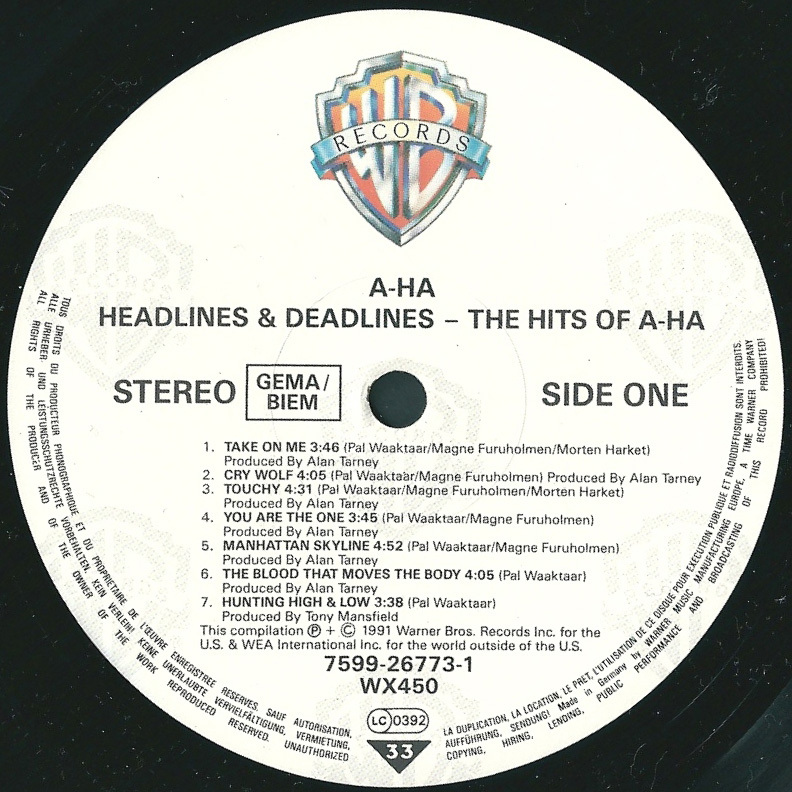 The Brazilian CD 1st pressing of Headlines and Deadlines was Manufactured by "Videolar" and Distributed by "Warner Music Brasil Ltda", it is similar to the European release except for the text in the right hand corner of the front sleeve and on the back sleeve is printed in white rather than in three colours. Also, all of the internal booklet text is also printed in white. 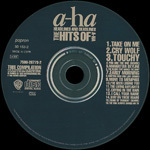 Displayed at the top right hand corner of the CD case is a silver "ifpi" hologram sticker. 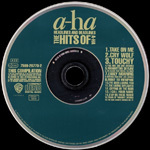 The actual disc is dark blue with a large yellow a-ha logo at the top. The remainder of the text is printed in silver. On the right hand side, we have the track listing displayed in a similar way to the European release. On the left hand side, there is some Brazilian Manufacturing information which reads "WARNER MUSIC BRASIL LTDA. TODOS OS DIREITOS RESERVADOS PROIBIDA A EXECUCAO PUBLICA. RADIOTELEDIFUSAO E LOCACAO FABRICADO POR VIDEOLAR INDUSTRIA BRASILEIRA - SOBLICENCA DA WARNER MUSIC BRASIL LTDA. CNPJ 42.470.112/0001-56". On the back cover underneath the barcode we have the usual "Warner Brothers Records" logo along with some additional logo's to include the "compact disc", "flying amazon bird" and anti-paracy contact number 0800-115751 logo. At the bottom left hand corner underneath the track listing we have the "www.warnermusic.com.br" website address, along with some Manufacturing and Distributing information "(P) (C) 1981 Wea International Inc. Warner Music Brasil Ltda. - Fabricado no Polo Industrial de Manaus por Videolar S.A. - Av Solimoes, 505 Distrito Industrial - CNPJ 04.229.761/0004-13 - Industria Brasileira Distribuido pela - Warner Music Brasil Ltda. CNPJ 42.470.112/0012-09". The first issue of this Videolar 1st pressing came without any batch issue coding on the actual spine and around the centre ring of the disc. At least three later re-issues of this 1st Videolar pressing are known to exist, these additionally came with the batch issue coding;- AA0001000, AC0002000 and AD0001000. 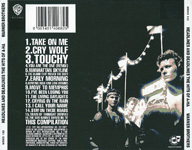 There is a second "Videolar" made CD release which is very similar to the previous release and again comes with the silver "ifpi" hologram sticker on the front of the CD case, there is also some slightly different Manufacturing and Distributing information on the back cover which reads "Warner Music Ltda., uma empresa Warner Music Group. Produzido no Polo Industrial de Manaus por Videolar S.A. Av. Solimoes, 505 - Distrito Industrial - Manaus - AM - CNPJ04.229.761/0004-13 - Industria Brasileira - Distribuido pela Warner Music Brasil Ltda. CNPJ 42470.112/0012-09 - ww.warnermusic.com.br". The usual "Warner Brothers Records", "compact disc", "flying amazon bird" and Anti-paracy logo's are again all included. The disc used on this second pressing is the same as the one used on the earlier Videolar pressing. There are at least two copies of this Videolar second pressing known to exist and again includes some additional batch issue coding printed on the spine and around the centre ring of the disc;- AF0001000 and AH0001000. 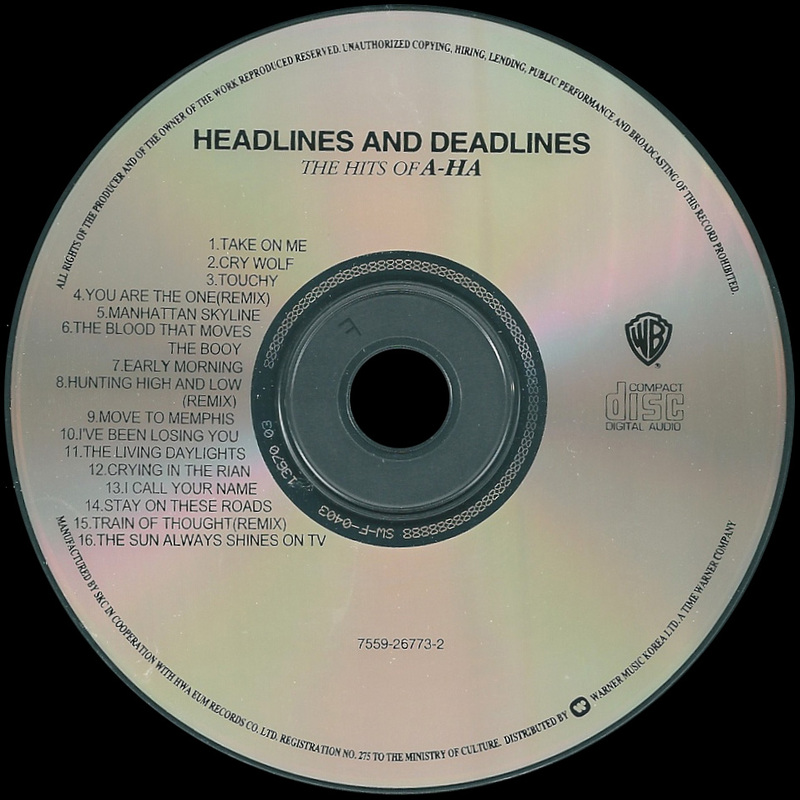 The Headlines and Deadlines CD was re-released a third time in Brazil by "Videolar" and comes with a similar layout and design to the earlier "Videolar" pressings. The Manufacturing and Distributing text on the back cover has again been slightly amended to read "Warner Music Brasil Ltda., uma empresa Warner Music Group. Produzido no Polo Industrial de Manaus por Videolar S.A. Av. Solimoes, 505 - Distrito Industrial - Manaus - AM CNPJ 04.229.761/0004-13 - Industria Brasileira Sob encomenda da Warner Music Brasil Ltda. CNPJ 42.470.112/0012-09 Distribuido pela Warner Music Brasil Ltda. CNPJ 42.470.112/0012-09 - www.warnermusic.com.br". On the back cover, we now only have on display the "flying amazon bird" and Anti-piracy logo's, the usual "Warner Brothers Records" and "compact disc" logo's have been removed. Again the exact same disc has also been included which was used on both the earlier Videolar pressings. There are at least eight known re-issues of this Videolar third pressing but come with different batch issue coding printed on the spine and around the centre ring of the disc;- AO0001000, AP0001000, AR0001000, AT0001000, AU0001000, AW0003000, AY0001000 and AZ0004000. There is another Brazilian CD release which was instead Manufactured and Distributed by "Sonopress" under license to "Warner Music Brasil Ltda. ", it comes with the usual front cover artworks, but the Manufacturing and Distributing information has been changed on the back sleeve to include some additional Copyright information which reads "Warner Music Brasil Ltda. - uma empresa Warner Music Group. Produzido no Polo Industrial de Manaus e distribuido por Sonopress Rimo Ind. e Com. Fonog. S.A. - Ind. Bras. Rua lca, no 100-A - Distrito Industrial - Manaus - AM - CNPJ67.562.884/0004-91. Sob Licenca de Warner Music Brasil Ltda - CNPJ 42.470.112/0012-09. Todos os direitos reservados. Proibida a reproducao, execucao publica e locacao desautorizadas sob as penas da lei. O prazo de validade do disco CD ou DVD e indeterminado desde que observado os seguintes cuidados. Amazenar em local seco, livre de poeira, nao expor ao sol, nao riscar, nao dobrar, nao engordurar, nao manter a uma temperatura superior a 55oC e umidade acima de 60g/m3 e segurar o disco sempre pela lateral e pelo furo central DISCO E CULTURA. Denuncie a pirataria: [email protected]" Also included on the back cover is the "flying Amazon bird" and Anti-piracy logo's, there is also some additional "Warnermusic" Website Addresses. 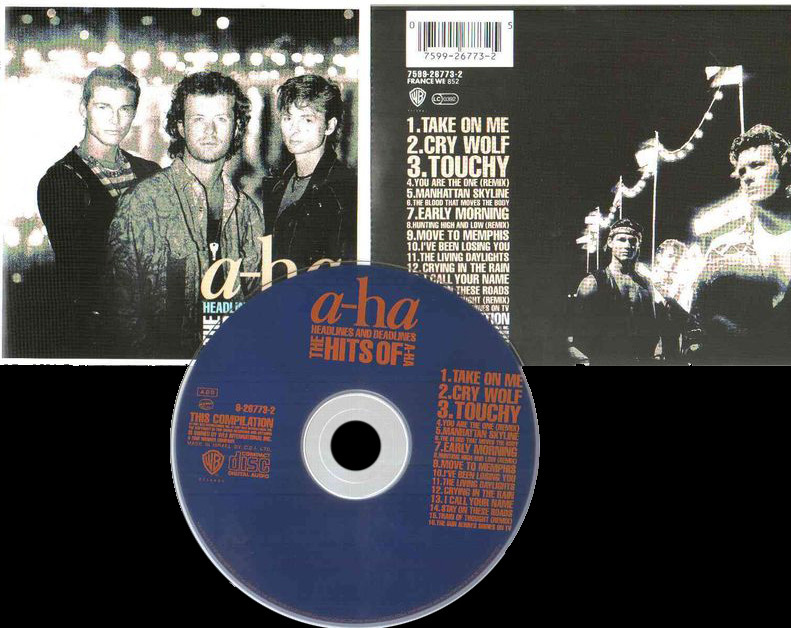 The actual disc itself is similar to the earlier Videolar pressings and again includes the large yellow a-ha logo at the top, the remainder of the text is printed in silver. The Manufacturing and Copyright information on the left hand side has also been changed "(C) (P) WEA INTERNATIONAL INC. Warner Music Brasil Ltda. Produzido no Polo Industrial de Manaus e distribuido por Sonopress Rimo Ind. e Com. Fonog. S.A. - Ind, Bras - CNPJ67.562.884/0004-91. Sob Licenca de Warner Music Brasil Ltda. - CNPJ42.470.112/0012-09. Todos os direitos reservados. Proibida a reproducao, execucao publica e locao desautorizadas sob as penas da lei". The "Warner Brothers Records" and "compact disc" logo's are also displayed as well as an additional "flying amazon" bird logo which did not appear on the earlier Videolar pressed discs. At least twelve re-issues of this Sonopress edition exist but come with different batch issue coding printed on the spine and around the centre ring of the disc; BB0005000, BD0010000, BF0010000, BG0001000, BH0006000, BJ0007500, BO0000500, BP0001000, BQ0000500, BR0001000, BS0000500 and BT0000500. 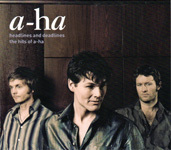 The Chilean CD album comes with a different font to both the a-ha logo and title "HEADLINES AND DEADLINES THE HITS OF A-HA" on the front cover and disc, some of the text printed inside the CD booklet has also been printed larger compared to the European release. The disc itself is navy with beige text. The first pressing was Manufactured and Distributed by "Warner Music Chile S.A." and comes with a Silver "ifpi" hologram sticker on the front of the CD case. 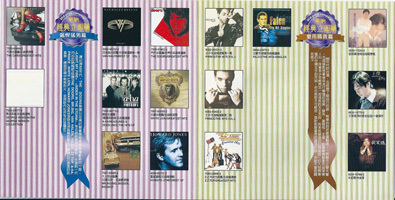 On the back sleeve and on the left hand side of the disc is some Manufacturing and Distributing information which reads "THIS COMPILATION (P)1991 WEA INTERNATIONAL INC., (C)1991 WEA INTERNATIONAL INC., THE COPYRIGHT IN THIS SOUND RECORDING AND ARTWORK IS OWNED BY WEA INTERNATIONAL INC. (P) 1998 WARNER MUSIC CHILE S.A. A TIME WARNER COMPANY FABRICADO Y DISTRIBUIDO POR WARNER MUSIC CHILE S.A.". 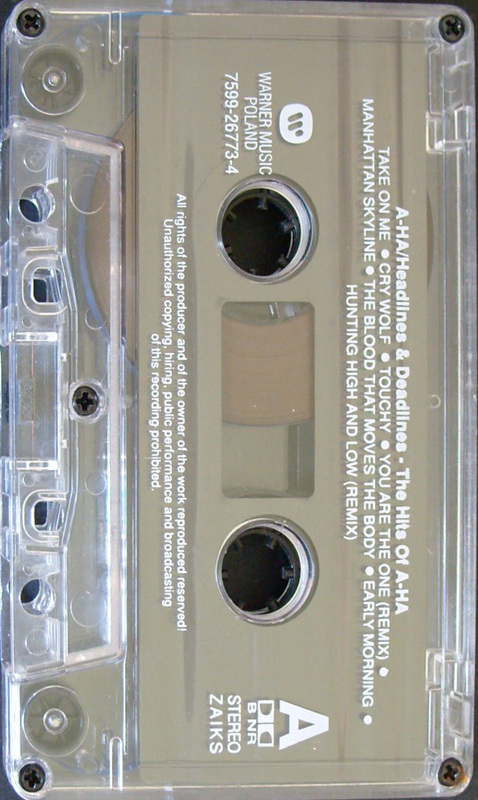 The Chilean cassette release of "Headlines And Deadlines" comes with a different layout and design compared to the European release. 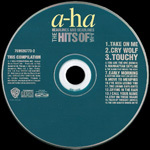 The front cover comes with the usual album artworks but printed in the centre with a white strip shown at both the top and bottom. The a-ha logo and title has been printed in the three usual colours beige, blue and white. The spine has a white background and displays the title "a-ha" in black, "HEADLINES & DEADLINES" in blue and "THE HITS OF A-HA" again in black. The "WB" logo, "DOLBY" logo, Catalogue number 198027 and "STEREO" are also shown in black. On the back cover which is also coloured white, we have the full track listing printed in English, side 1 and side 2 are shown in Spanish as LADO 1 And LADO 2. There is also some "DOLBY" information which has also been printed in Spanish. 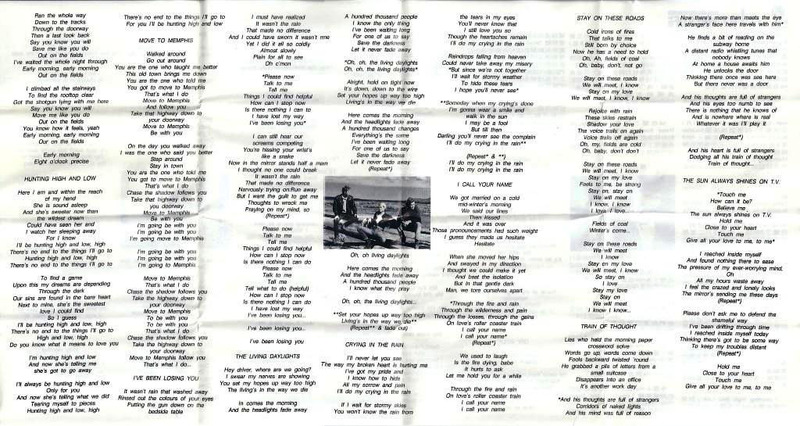 On the inside of the insert which is white with black text, the full track listing is shown on the left hand side all in English along with some production information, track lengths and track credits. There is also some Manufacturing and Distributing information which reads "Fabricado y distribuido por EMI Odean Chilena S.A. Santiago - Chile". 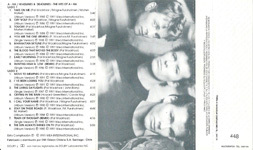 Also displayed inside the insert is a black and white picture of the three band members taken from the artworks used for the single "You Are The One". On the reverse of the spine and back cover, there is some Spanish Copyright information along with some other contact telephone numbers "ITURRA & GUGLIELMI DISENADORES TEL. : 399179" and "MULTIGRAFICA - TEL. : 5567134". 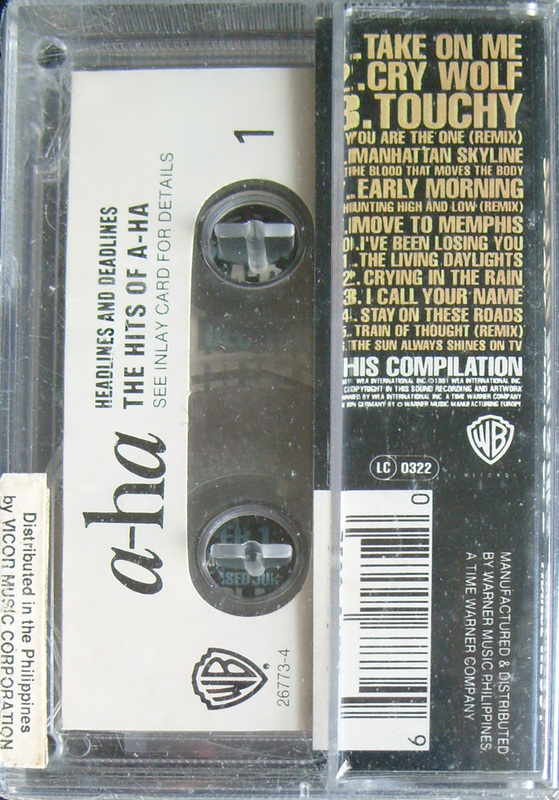 The actual tape is clear transparent with a grey centre and white printed text, it displays "A-HA/HEADLINES & DEADLINES - THE HITS OF A-HA" with the track listing at the top and some Manufacturing, Distributing and Spanish Copyright information at the bottom. 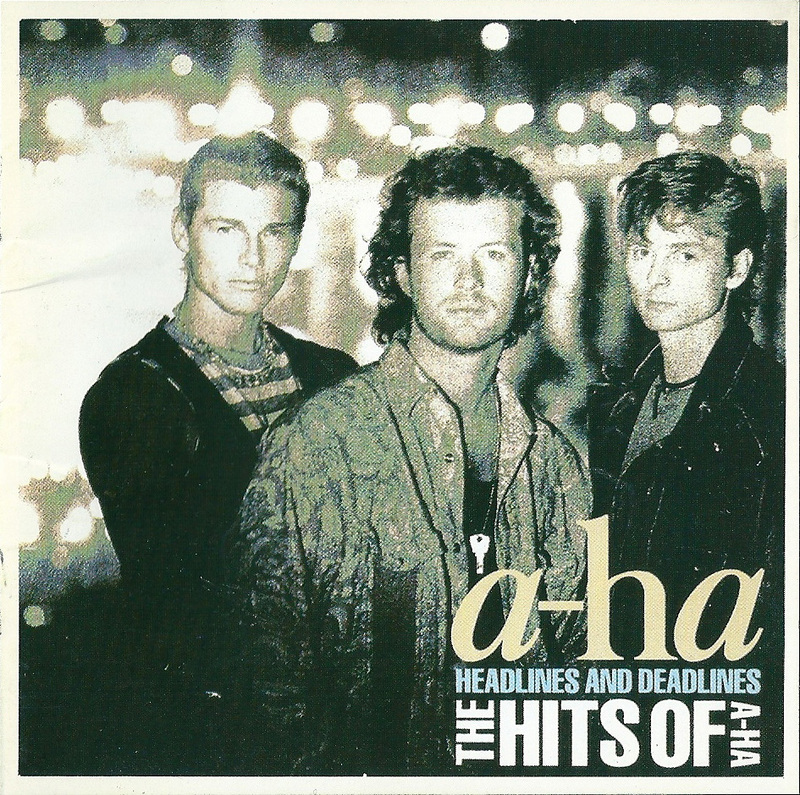 "Headlines And Deadlines" was also released onto CD in the Czech Republic and was distributed by "POPRON" but licensed by "Warner Bros". On the back sleeve at the top left hand corner the "Popron"logo is printed in black letters on a white background with the coding 50 153-2 displayed underneath, the rest of the sleeve is otherwise of a similar design to the original European release which includes the same Catalogue number 7599-26773-2 FRANCE WE 852. The disc itself is also navy with beige text, on the upper left hand side it additionally displays "popron", along with the coding 50 153-2 and "MADE IN CSFR". 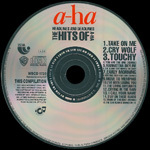 The Record Company information on the left hand side has also been amended to omit the text; "MADE IN GERMANY BY WARNER MUSIC MANUFACTURING EUROPE", plus the regular "GEMA/BIEM" logo has been replaced instead with an "OSA" logo. Some pressings of the disc come with a large centre silver ring whilst others use the more standard clear plastic ring. The matrix coding on both discs is however the same; "GZ CC1014 50 153-2". The first European CD release was "Manufactured in Germany by Warner Music Music Manufacturing Europe", the front cover displays the colour group-shot of the three band members by Just Loomis. 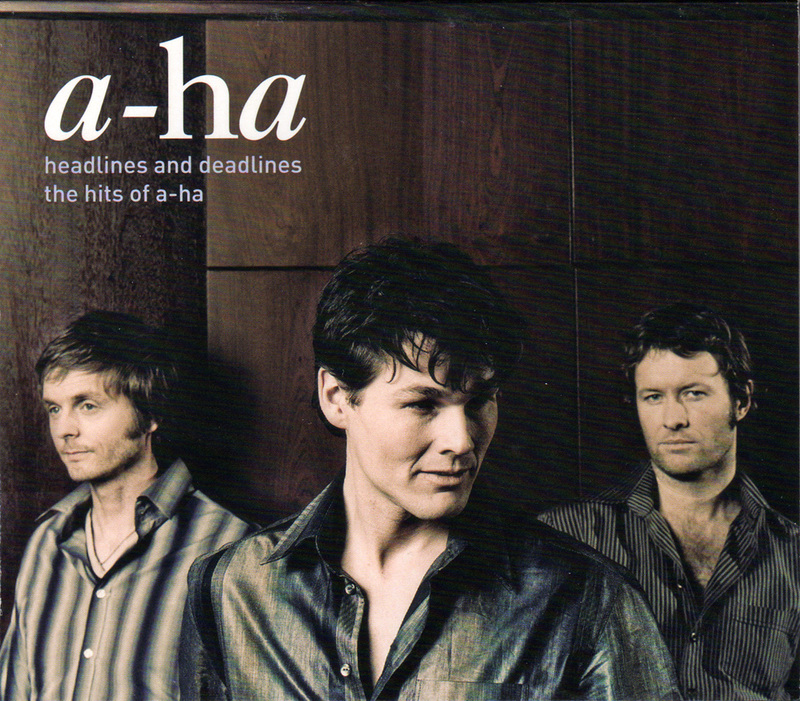 The a-ha logo is printed in beige at the bottom right hand corner with the title "HEADLINES AND DEADLINES" in light blue and "THE HITS OF A-HA" in white underneath. 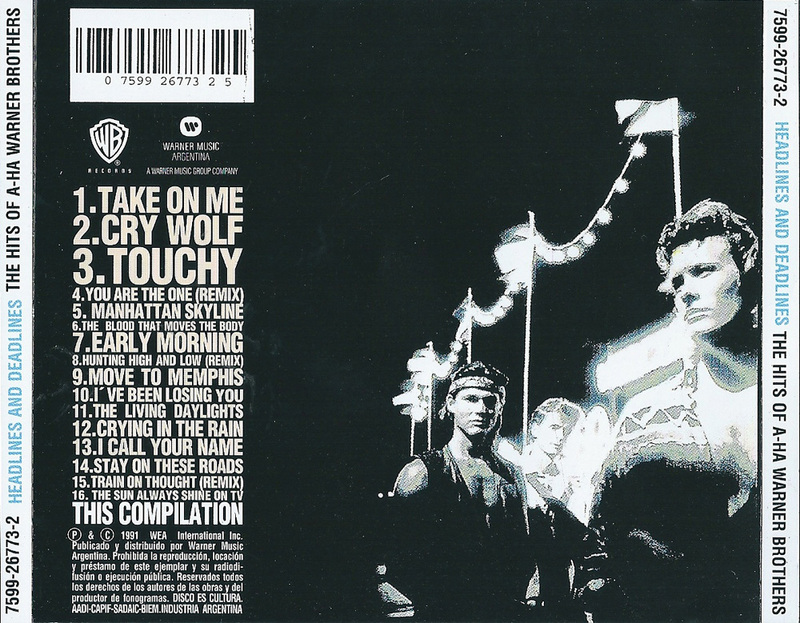 The back cover is black and displays the artworks for the Move To Memphis single. The white barcode is displayed in the top left hand corner with the Catalogue number 7599-26773-2 FRANCE WE 852 underneath. The full track listed is printed in cream down the left hand side, the "Warner Brothers Records" and "LC 0392" coding is also present. There is some Manufacturing and Copyright information displayed at the bottom left hand corner under the large text "THIS COMPILATION" which is printed in white, it reads "(P) 1991 WEA INTERNATIONAL INC. (C) 1991 WEA INTERNATIONAL INC. THE COPYRIGHT IN THIS SOUND RECORDING AND ARTWORK IS OWNED BY WEA INTERNATIONAL INC. A TIME WARNER COMPANY MADE IN GERMANY BY WARNER MUSIC MANUFACTURING EUROPE UNAUTHORISED COPYING, HIRING, LENDING, PUBLIC PERFORMANCES OR BROADCASTING OF THIS RECORD PROHIBITED". The release also comes with the 6 page CD booklet which features pictures taken from different single releases printed on a black background, the text included is printed in three different colours beige, blue and white. The disc itself is coloured navy blue with beige text and doesn't have the silver rim around the outer edge of the disc. 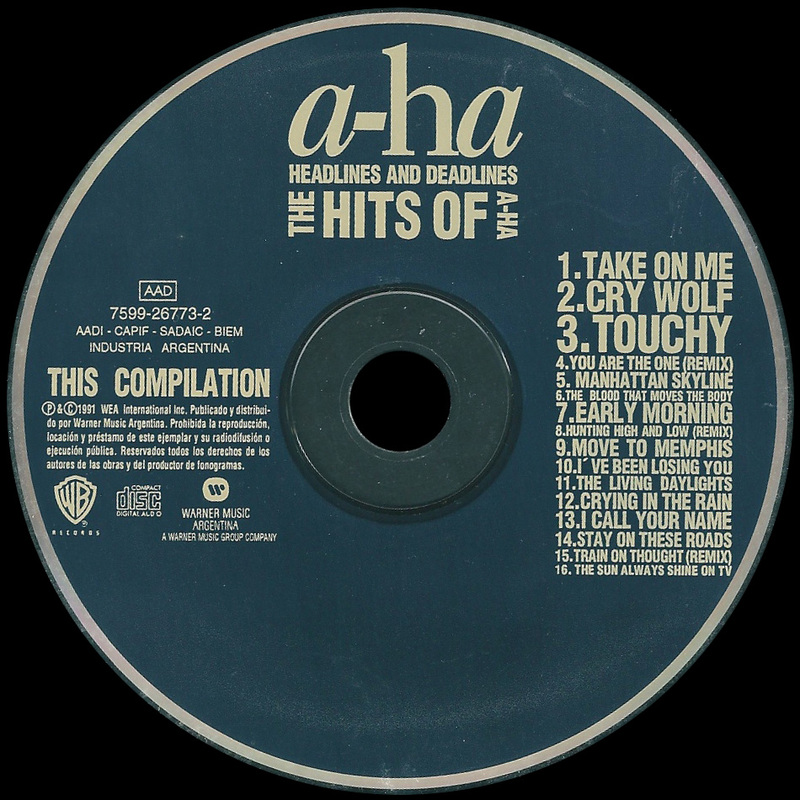 The title "a-ha HEADLINES AND DEADLINES THE HITS OF A-HA" is shown at the top, with the track listing located down the right hand side. The Catalogue number 7599-26773-2, Manufacturing information and "Warner Brothers Records", "COMPACT disc DIGITAL AUDIO" and "GEMA/BEIM" logo's are shown on the left hand side. Some Copyright information is also included around the bottom edge of the disc. There is also some Matrix coding shown around the centre ring of the disc which reads 759926773-2 WME. This edition was available in the UK, see above. There is another issue of this European CD album which again comes with the same front and back cover artworks, it also uses the same Catalogue number on the back cover 7599-26773-2 FRANCE WE 852 as the first release. The usual CD booklet is also included. The disc is again navy with beige text but now includes an outer silver ring to it which doesn't appear on the first issue. The Matrix coding around the centre ring is also slightly different to read 7599267773-2.2 WME. There is a third issue of the European CD album which uses the same 7599-26773-2 FRANCE WE 852 Catalogue number on the back cover, again the front and back cover is identical to the earlier issues and the same CD booklet is also included. The design of the disc used is the same as the first issue and doesn't include the outer silver rim on the edge of the disc which appeared on the second issue, but the Matrix coding has again been changed to now read 759926773-2.3 WME. 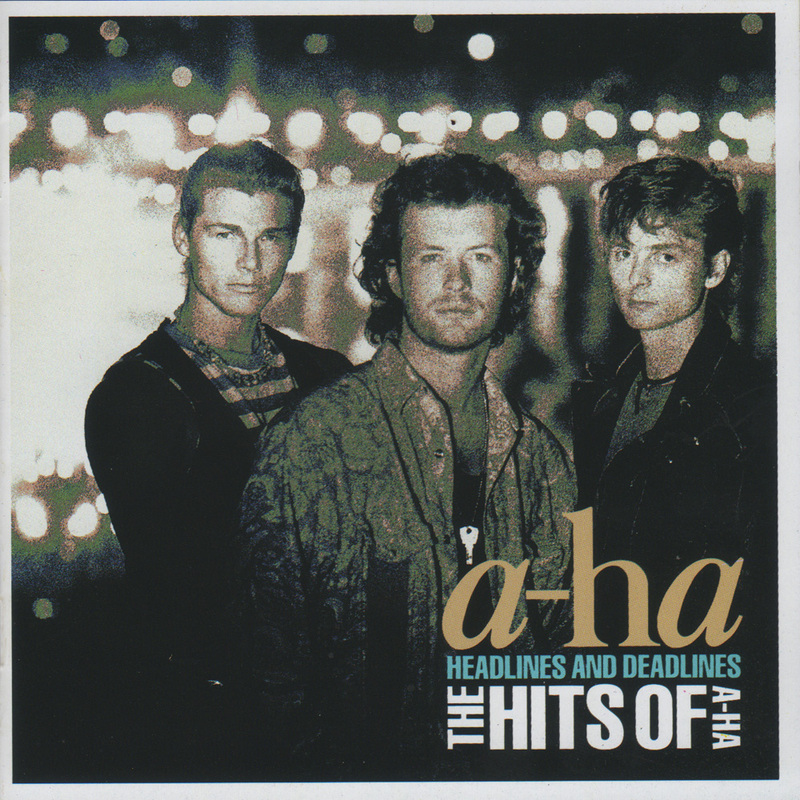 In June 99, there was a another European CD album re-issue of "Headlines And Deadlines" which was again "Manufactured in Germany by Warner Music Manufacturing Europe", it comes with the same usual front and back cover artworks to the early 7599-26773-2 FRANCE 852 pressings, but now includes a different Catalogue number 7599-26773-2 WE 835 on the back cover, the FRANCE part of the Catalogue number has now been omitted. Additionally displayed on the front cover of the CD case is a round yellow sticker with a white ! sign. The same usual CD booklet is also included. The disc is again navy and includes an outer silver rim to the disc, but the text has now been printed in cream (rather than beige), making it much more clearer. Also the track listing displayed on the right hand side is somewhat smaller compared to the earlier 7599-26773-2 FRANCE 852 pressings. The "Warner Music Europe" Logo has also been inscribed onto the silver centre ring of the disc and the Matrix coding has now been changed to 759926773-2.3 06/99. The "Headlines And Deadlines" European CD album re-issue was again re-released with the same Catalogue number 7599-26773-2 WE 835, the usual front and back cover artworks has been used and it also includes the exact same CD booklet. On the front of the CD case we have an additional "WARNER PLATINUM SPECIALS" black and grey sticker. The colour of the disc itself has now changed from the usual navy to now dark green, the text has again been printed in cream and just like the previous CD re-issue there is a silver outer rim to the disc. The Matrix coding around the Centre ring of the disc reads 7599267732 01. There is another European CD album edition of the "Headlines And Deadlines" which uses the Catalogue number 7599-26773-2 WE 835 and includes the same front and back cover sleeves but additionally comes in a white tray, rather than a grey one, the disc itself also differs and comes instead with a large silver double ring. There appears to be at least two slightly different coloured discs which are known to exist, one is navy and the other is greeny blue, both include the same matrix coding around the centre rim which reads 7599267732 #1. The layout and design is otherwise exactly the same. There is another European made CD release of "Headlines And Deadlines" which comes with another different Catalogue number 7599-26773-2 FRANCE WE 833 on the back cover compared to the regular 7599-26773-2 FRANCE WE 852 and reissue 7599-26773-2 WE 835 European editions. It is not thought that this pressing was used for the general release in the UK as it seems rather scarce. This 7599-26773-2 FRANCE WE 833 edition is very similar to the earlier 7599-26773-2 FRANCE WE 852 first release which includes the same disc which is navy with beige text and comes without the outer silver rim on the edge of the disc. it also includes the same matrix coding reference 759926773-2 WME. The Manufacturing information also displays that it was "Manufactured in Germany by Warner Music Manufacturing Europe", it also comes with the same front and back cover artworks and includes the 6 page CD booklet. There is a regular French CD release of "Headlines And Deadlines" which comes with the same front and back cover artworks to the European pressings, but the Catalogue number 7599-26773-2 FRANCE: WE 391 on the back cover and disc has changed. The disc also additionally includes the word "FRANCE" which doesn't appear on the European discs. The white barcode on the back cover is also slightly smaller compared to the European release, it also includes the same European CD booklet. The Manufacturing and Copyright information is exactly the same as the European release and reads "THIS COMPILATION (P) 1991 WEA INTERNATIONAL INC. (C) 1991 WEA INTERNATIONAL INC. THE COPYRIGHT IN THIS SOUND RECORDING AND ARTWORK IS OWNED BY WEA INTERNATIONAL INC. A TIME WARNER COMPANY MADE IN GERMANY BY WARNER MUSIC MANUFACTURING EUROPE UNAUTHORISED COPYING, HIRING, LENDING, PUBLIC PERFORANCES OR BROADCASTING OF THIS RECORD PROHIBITED". 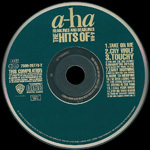 The disc itself is Navy and the a-ha logo at the top is coloured cream, the remainder of the text is displayed in silver. There is an outer rim to the disc which is clear rather than silver which appears on some of the later European pressings of the same album. The layout is vertually the same as the earlier European pressings including the track listing down the right hand side and the Catalogue number, Manufacturing information and "Warner Brothers Records/COMPACT disc DIGITAL AUDIO" logo's on the left hand side. The usual Copyright information which appears around the bottom edge of the disc has been omitted from this French pressing. 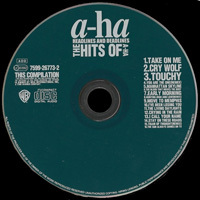 In 1996, the album was rereleased in the same case, but slipped inside a unique white carton sleeve sponsored by NRJ radio. On the spine and cover of the sleeve it calls the album "Best Of a-ha". 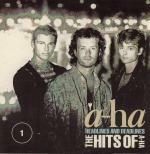 On the front of the sleeve there is a group shot (Pål, Morten and Mags) in the centre. There is something a little bit stange about this photo as Morten has bright green eyes rather than his normal blue ones! 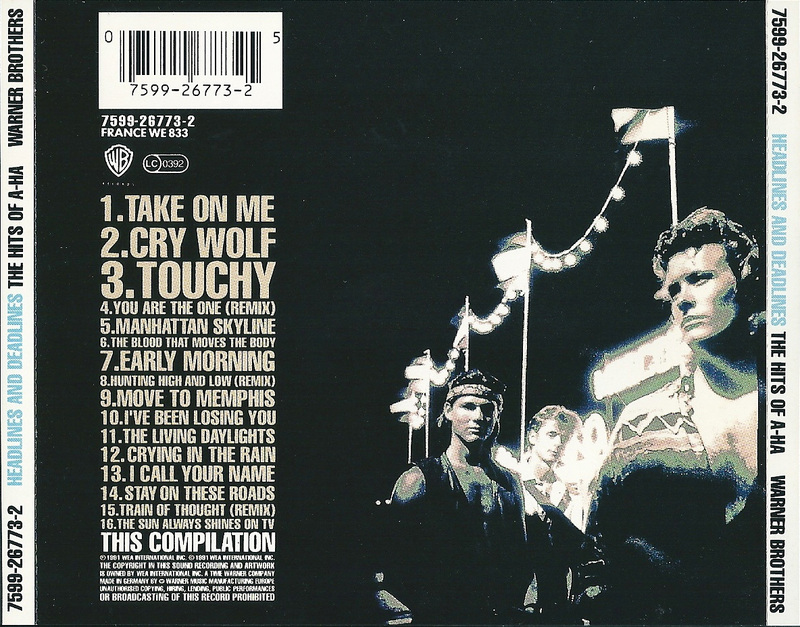 The edition inside the slipcase is almost identical to the European FRANCE WE 852, 7599267773-2.2 WME edition, but the silver ring around the edge of the disc is thinner, and the track listing displayed on the right hand side of the disc is slightly smaller. Above the picture there is a large red a-ha-logo, the words "Best Of" in black letters with a red `shooting star' passing through the title. 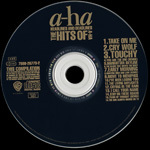 "16 titres" printed in black letters inside a red rectangle in the top right corner indicates the number of tracks on the CD. Below the picture five of the tracks are mentioned and to the right is the NRJ-logo. 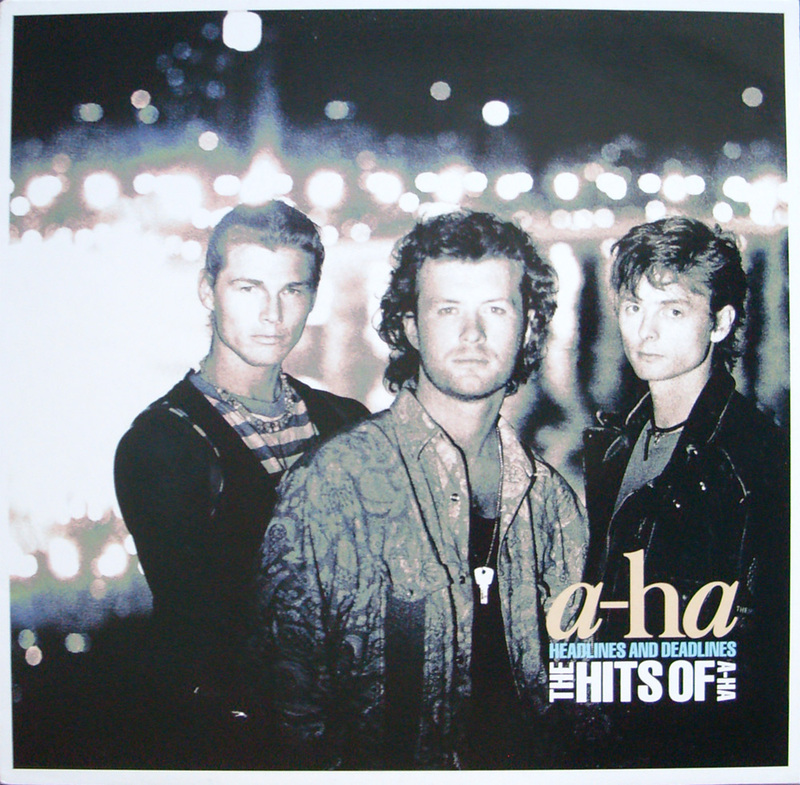 The background of the reverse of the sleeve is a red square with a white border and a large black outlined a-ha-logo. 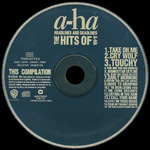 The track li stings are in white and there is a small colour shot of the "Headlines And Deadlines" album in the bottom left hand corner. The CD inside the packaging is the same as the regular edition of "Headlines And Deadlines" except that the disc is a lighter petrol blue colour with lighter coloured writing. There is another French slip-case version of "Headlines and Deadlines". The cover is black with a thick red sripe along the bottom. A picture of the regular album cover with a thin white border is printed in the bottom right section. 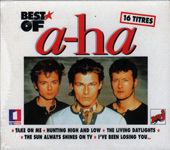 The title " best of A-ha" is printed in large white letters top left with a red star behind. There is a German Club CD Edition of Headlines And Deadlines which comes with an additional Catalogue number 46 293 7 on the back sleeve and spine of the CD case. The disc comes in a white disc tray and is navy with white text instead of the usual beige colour. The disc also comes with a silver outer rim on the edge of the disc and uses the original matrix coding reference 759926773-2 WME. It also comes with the same front and back cover artworks and includes the 6 page European booklet. There is a German acetate CD which comes with a white stiff folded insert with the title in black on the front and tracks listed on the back. Promo information and blue logos are printed at the bottom of the front of the insert. The disc is blank on both sides apart from the catalogue number etched around the centre. The album was also Manufactured and released on DCC (Digital Compact Cassette) in Germany. The artworks on the front cover and spine is virtually the same as the regular release, there is a ten paged mini booklet included inside displaying the usual artworks for each single. The background colouring on some of the pages is however different compared to the CD booklet. The back cover comes with a white barcode and all of the other text is shown in white. The artworks for the single Move to Memphis is also shown. The full track listing is printed down the left hand side with some Manufacturing and Copyright information which reads "MADE IN GERMANY. UNAUTHORISED COPYING, HIRING, LENDING, PUBLIC PERFORMANCE OR BROADCASTING OF THIS PRODUCT PROHIBITED". The Catalogue number 7599-26773-5 DCC and "WB Records" logo are also included. The spine is very similar to the video release with the title being displayed landscaped in the centre on the usual blue background, the "DCC DIGITAL COMPACT CASSETTE" logo is shown at the top and the Catalogue number "France WE 095 7599-26773-5 DCC" and "WB Records" logo at the bottom. On the inside of the back cover which is removable and actually folds out to display the same front cover artworks, and includes some other operating and looking after your DCC information. The tape itself is charcoal and shows the front cover artworks on the top, with the title, "WB Records" logo and Catalogue number displayed on the spine. The same Manufacturing and Copyright information is additionally included on the bottom of the tape. The album Headlines and Deadlines can be found inside a special Memorial Beach promo case. Click here for details. There is Greek CD release of "Headlines And Deadlines" which comes in a Cardboard Digi-pak instead of the usual Jewel case, it displays the usual front and back cover artworks. There is no barcode on the back cover and the Catalogue number has been changed to 6302270043. The Manufacturing and Copyright information which is displayed on both the back cover and on the actual disc reads "(P) 1991 WEA INTERNATIONAL INC. (C) 1991 WEA INTERNATIONAL INC. THE COPYRIGHT IN THIS SOUND RECORDING AND ARTWORK IS OWNED BY WEA INTERNATIONAL INC. A TIME WARNER COMPANY. UNAUTHORISED COPYING, HIRING, LENDING, PUBLIC PERFORMANCES OR BROADCASTING OF THIS RECORD PROHIBITED. MANUFACTURED BY GENERAL PUBLISHING COMPANY S.A. UNDER LICENCE FROM WARNER MUSIC GREECE S.A.". The inside of the Digi-pak displays the artworks used for the "Stay On These Roads" Single showing the autumn scene. On the left hand side, it houses the 6 page booklet which is the same as the European release but does not include the Catalogue number on the back page. On the right hand side it comes with a clear plastic tray holding the actual disc which is coloured a very faint green with clear text, the disc was also made by FABELSOUND. This album was also manufactured and released on DCC (Digital Compact Cassette) in Holland. The design of the front cover and spine is virtually the same as the German DDC release, it also includes the same ten paged mini booklet inside displaying the usual artworks for each single, but the background colouring on some pages being different compared to the CD release. The fold out back cover is again the same as the German made DDC, including the same white barcode and displaying all the other text in white. The artworks for the single Move to Memphis is also included and the full track listing is printed as usual down the left hand side. The Manufacturing and Copyright information has been amended to "MADE IN HOLLAND UNAUTHORISED COPYING, HIRING, LENDING, PUBLIC PERFORMANCE OR BROADCASTING OF THIS PRODUCT PROHIBITED". The same Catalogue number 7599-26773-5 DCC and Warner Brothers Records logo are also included. 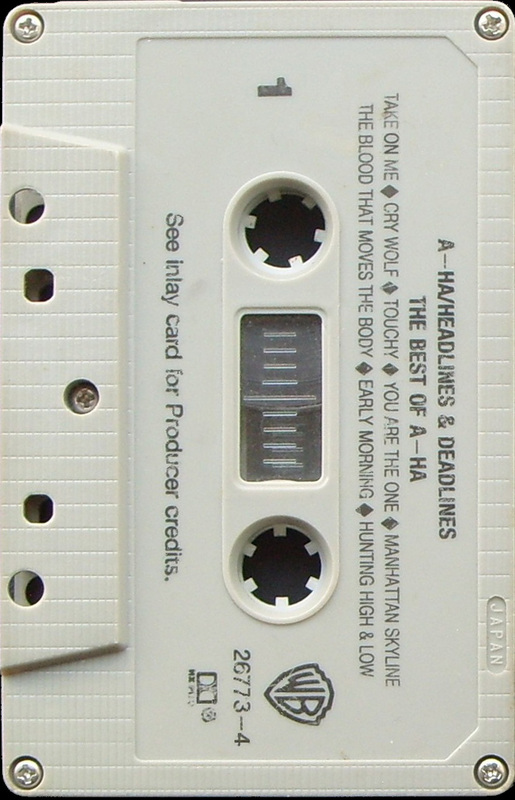 The layout of the tape is the same as the German release apart from the Manufacturing information now displays "MADE IN HOLLAND" on the bottom. The Indonesian cassette is similar to the European release with a fold out sleeve but has the text "Hanya Untuk Dijual Di Indonesia" printed in white at the top of the sleeve. 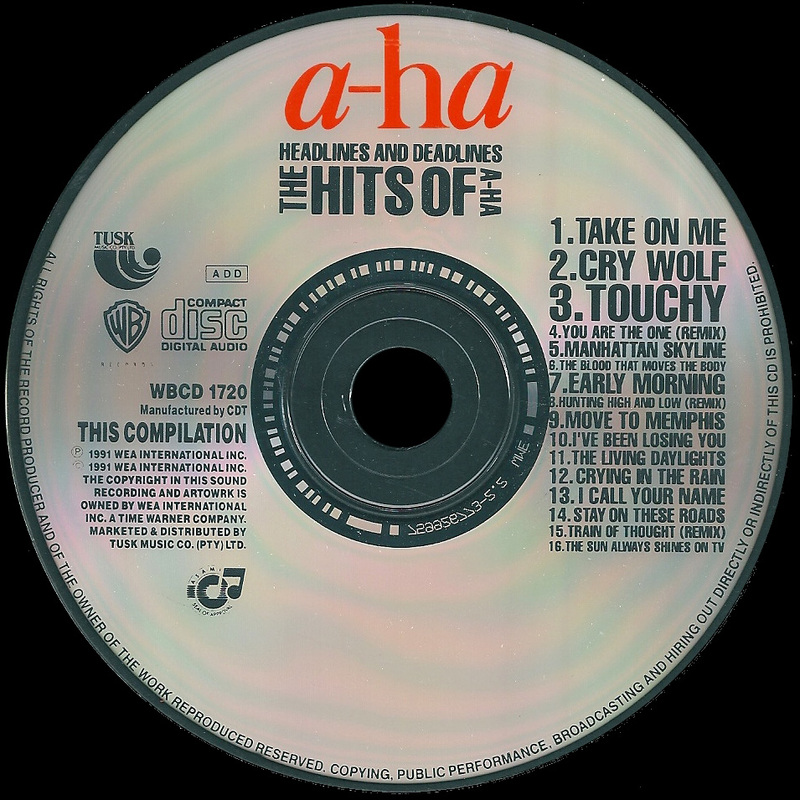 There is also a round white sticker included on the front cover of some copies, displaying the text and Catalogue Number; "INCLUDING THE RADIO HITS MOVE TO MEMPHIS W0251-1". 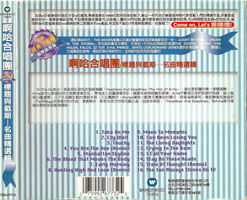 On the inside of the folded insert on side 2 above the artworks for "Move to Memphis", it displays some Manufacturing and Copyright information which reads "Manufactured in Indonesia under licence from WEA International Inc. No licence is granted or is to be implied by the sale or supply of this cassette or container there of under or in relation to any trademark of copyright of or owned by WEA International Inc. anywhere in the world outside Indonesia". On the back cover, it additionally includes some other Trademark information which reads "Trade mark and recording licensed to PT. Aquarius Musikindo for manufacture and sale in Indonesia only", it also includes the European Catalogue numbers printed in white above the bar code. An additional Indonesian Catalogue number W0251-1 is also displayed at the bottom of the spine. The tape is transparent clear with a grey centre piece and white printed text. 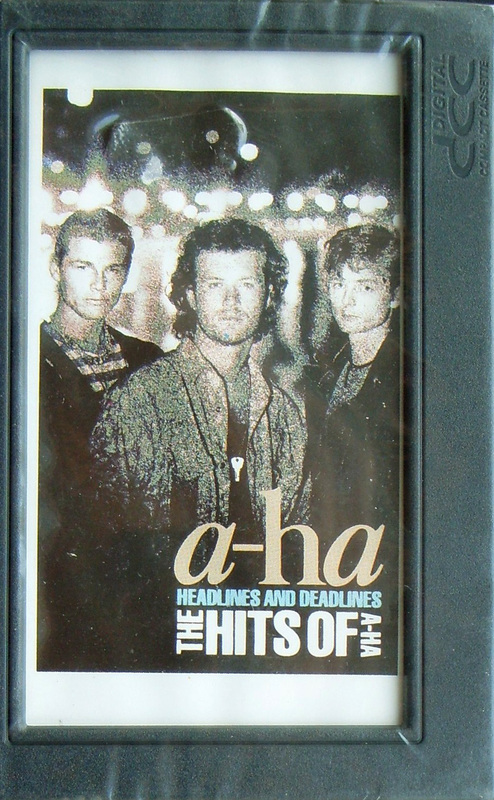 The title "HEADLINES AND DEADLINES THE HITS OF A-HA" is displayed along the top of each side, with "SEE INLAY CARD FOR DETAILS•" underneath. The "WB" logo is included on the left hand side, with STEREO and the Catalogue number 7599 26773-4 on the right. The lower half of the tape again on both sides, displays some Production and Copyright text; "℗ & © 1991 WEA INTERNATIONAL INC." and "ALL RIGHTS RESERVED. UNAUTHORIZED COPYING PUBLIC PERFORMANCE BROADCASTING OF THIS RECORDING FORBIDDEN". There is an Israel CD album which comes with the standard German made European 7599-26773-2 WE 835 CD case displaying the regular front and back cover artworks printed in the three usual colours, the usual European colour booklet is included. The disc inside is different and is coloured instead navy blue with tan coloured text. It displays on the left hand side the usual Production and Copyright information; "THIS COMPILATION ℗ 1991 WEA INTERNATIONAL INC. © 1991 WEA INTERNATIONAL INC. THE COPYRIGHT IN THIS SOUND RECORDING AND ARTWORK IS OWNED BY WEA INTERNATIONAL INC. A TME WARNER COMPANY". It also states that it was "MADE IN ISRAEL BY C.D.I. LTD." and includes the additional oval "HED ARZI" logo, in addition to regular "WB RECORDS", "COMPACT disc DIGITAL AUDIO" and "ADD" logos. 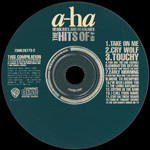 The usual track listing in the different font sizes is printed down the right hand side, with the standard Copyright information around the bottom rim of the disc; "•ALL RIGHTS OF THE PRODUCER AND OF THE OWNER OF THE WORK REPRODUCED RESERVED. UNAUTHORIZED COPYING, HIRING, LENDING, PUBLIC PERFORMANCE AND BROADCASTING OF THIS RECORD PROHIBITED.•" The Catalogue number displayed on the disc is 9-26773-2. 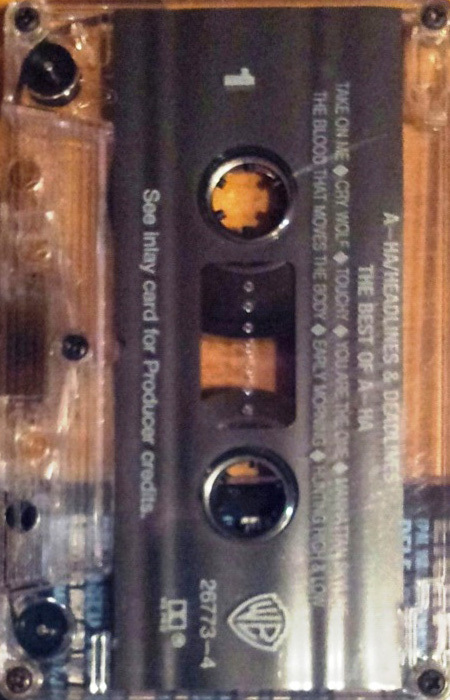 The Israel made cassette comes with a similar front and back cover to the European release including the text being in the three usual colours. There is no Catalogue number displayed at the bottom of the spine. On the back cover, the usual white barcode has been replaced with a black and white text box displaying some Manufacturing and Distributing information in both English and Hebrew; it reads "(P) & (C) 1991 רמתיגן, תרארת הארץ (1973) בע''מ, החלזון 4, מיוצר ומופץ ע"י הד ארצי מקגוצת תעריכ MANUFACTURED AND DISTRIBUTED BY HED ARZI (1973) LTD. RAMAT-GAN, MADE IS ISRAEL". On the inside of the folded insert on side 2 under the track listing and credits, there is some further Hebrew text displaying where the cassette artworks was printed; "הדפםה ולוחות: דפום מיאי כע''מ " There appears to be at least two different variation of tapes. The first edition comes with a white tape with blue printed text, whilst the second edition, comes instead with black printed text. The layout and design of both editions is otherwise exactly the same. 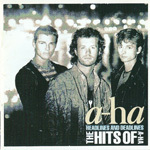 The title is displayed along the top "HEADLINES AND DEADLINES/THE BEST OF A-HA" with the track listing to each side underneath. At the bottom of side 1, there is some copyright information which reads "ALL RIGHTS OF THE OWNER AND OF THE PRODUCER OF THE RECORDED WORK ARE RESERVED UNAUTHORISED COPYING, PUBLIC PERFORMANCE, BROADCASTING, HIRING OR RENTAL OF THIS RECORDING IS PROHIBITED ℗ 1991 HED ARZI (1973) LTD © 1991 HED ARZI 1973 LTD MADE IN ISRAEL". On side 2 at the bottom of the tape, the Copyright information has been instead printed all in Hebrew; " העתקתו, השאלתו, שכירתו,השםעתו כצ'כור וש'רורו של תקל'ט זה כל זכויות היצרן. הםפיק והכעכים שכ היצירות הםוקלטות שםורות .ללא רשות - אטורים" On the left of each side, it displays a "wea" logo, whilst on the right hand side, the Catalogue number WB 926773 4 and "ACUM" logo are shown. The "הד ארצי HED ARZI RECORDS" logo and Side צַד are additionally printed in both English and Hebrew. On the back of the cassette case, it has the text "ISRAPHON" engraved into the plastic. 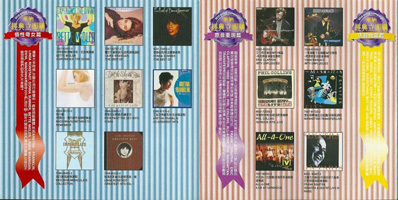 The regular first Japanese CD album was released on the 18th November 1991 and comes with a white and green obi strip with red, black, yellow, blue and white text. It comes with a white folded lyric sheet with tracks in both English and Japanese. The Manufacturing and Copyright information at the bottom of the back cover is printed in beige instead of the usual white, it reads "THIS COMPILATION (C) 1991 WEA INTERNATIONAL INC. WARNER BROS. RECORDS INC., A TIME WARNER COMPANY 3300 WARNER BLVD. BURBANK, CA 91505-4694. 75 ROCKEFELLER PLAZA, NEW YORK NY 10019-6908. PRINTED IN JAPAN. ALL RIGHTS RESERVED. UNAUTHORIZED DUPLICATION IS A VIOLATION OF APPLICABLE LAWS. WPCP-4610". 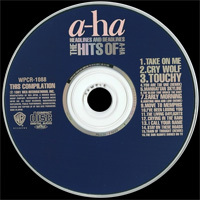 The disc is Navy with a Pink a-ha logo at the top, the rest of the text is printed in silver. The promo edition has a white and red promo sticker on the reverse plus the disc has some black Japanese "サンプル" (SAMPLE) text printed in black around the centre of the disc. Headlines And Deadlines was re-released in Japan on the 25th April 1997 as a "Hot Price" album. It has a different catalogue number WPCR 1088 compared to the "regular" first release. The obi strip is white and yellow with black text and comes with the red and yellow "bomb" hot price logo. It comes with a white tray, rather than grey and includes an additional white lyric booklet instead of the folded sheet, displaying all the tracks in both Japanese and English. 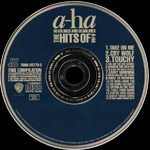 The disc is again Navy with the pink a-ha logo at the top and silver text. 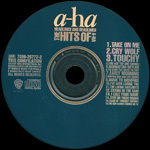 The promo edition comes with a red and white japanese sticker stuck over the Manufacturing information on the back cover and the word "SAMPLE" is etched in black around the centre of the disc. There is another Japanese re-issue which was released after the "Lifelines" album. It comes instead with a black obi strip with gold, blue and white text plus a colour shot of the "Lifelines" album. The disc used is exactly the same as the one previous used on the Hot Price album release and comes again in a white disc tray. It also comes with the same white paper booklet with the lyrics in both Japanese and English. The same catalogue number WPCR-1088 has also been used. The album was re-released on 10 October 2007 as a "Special Price ¥1,500" CD Album by "Rhino" and is similar to the previous WPCR-1088 release but has a different obi-strip and catalogue number. The obi-strip is white on the front with red and black text plus the price (¥1,500) is printed in a red circle at the top and the Warner Brothers Records/Rhino logo's at the bottom, on the reverse of the obi-strip which is grey with black text, we have the track listing printed in Japanese along with a red rectangular box containing some Rhino information. The usual white paper lyric booklet is included and the Catalogue number is WPCR-13055. The Japanese album was re-issued again on 1 April 2009, it is almost identical to the earlier releases described above but has another different obi-strip and catalogue number. The front of the obi-strip is white with black and red text plus a large red "special price" circle with the price (¥1,500) printed in yellow. The back of the obi-strip is white with black text and again displays the full track listing in Japanese, the inside of the obi-strip is white with a "Warner Music Life" advert. It also comes with the white paper lyric booklet. The promo edition comes with a red and white japanese sticker stuck over the barcode on the back of the obi-strip and the word "SAMPLE LOWNED" is etched in orange around the centre of the disc. The catalogue number is WPCR-13393. There is an ULTRA BEST 2015 Japanese CD edition of Headlines And Deadlines which was released on the 25 February 2015, it comes with a blue obi-strip displaying a golden coin on the front with the price (¥1200) shown in white. On the reverse we have the full track listing shown along with the http://wmg.jp/special/ultrabest2015/ website address. The regular white paper lyric booklet is also included. The Catalogue number is WPCR-16258. The Korean CD release comes with a similar front and back cover to the European release, it also includes the same colour booklet. The white barcode on the back cover is larger compared to the European release and includes a different number 8 801035 305311. The first pressing comes with a light blue disc with beige text, the a-ha logo and title "HEADLINES AND DEADLINES THE HITS OF A-HA" at the top has been printed and displayed in a different font compared to usual. On the left hand side, the standard Catalogue 7599-26773-2 is shown with some record company information underneath "THIS COMPILATION IS OWNED BY WEA INTERNATIONAL INC. C.P. 1991 WARNER MUSIC KOREA". The usual "Warner Brothers Records", "COMPACT DISC DIGITAL AUDIO" and "GEMA/BIEM" logo's are also present. On the lower left hand side of the disc it displays the Korean Catalogue number SW-F-0403 for the Album. Around the top edge of the disc we have some Copyright information, whilst at the bottom edge we have some Manufacturing information which reads "MADE IN KOREA BY SKC C.P.1991 WARNER MUSIC KOREA". At the bottom of the back cover, the usual Manufacturing and Copyright information has been over-dubbed with a white text box displaying the following information in black "(P) 1991 WEA INTERNATIONAL INC. (C) 1991 WEA INTERNATION INC. THE COPYRIGHT IN THIS SOUND RECORDING AND ARTWORK IS OWNED BY WEA INTERNATIONAL INC. A TIME WARNER COMPANY UNAUTHORISED COPYING, HIRING, LENDING, PUBLIC PERFORMANCES OR BROADCASTING OF THIS RECORD PROHIBITED". Displayed on spine is both European and Korean Catalogue Numbers 7599-26773-2 (SW-F-0403). 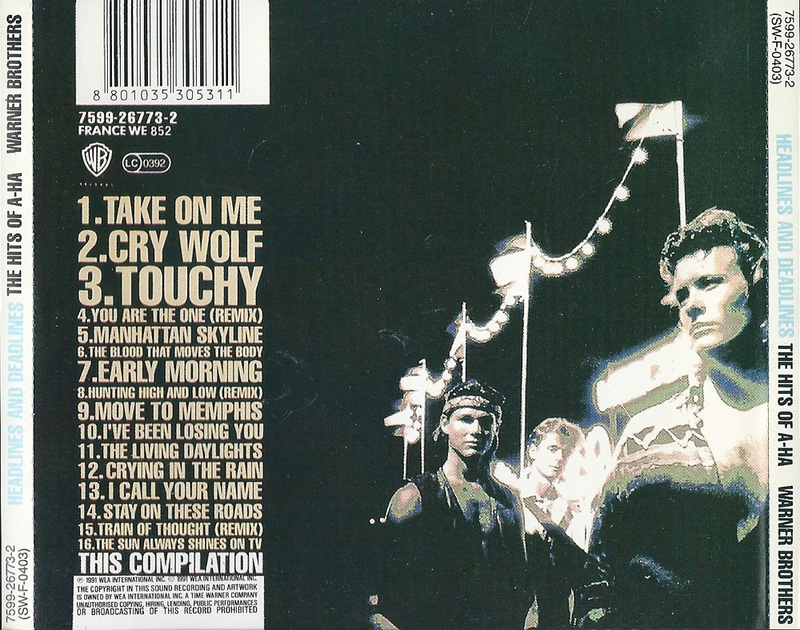 The second pressing comes with a similar front and back cover to the first pressing although the Manufacturing and Copyright information displayed at the bottom left hand corner of the back cover has again been over-dubbed this time in black with white text, it reads "Distributed by WARNER MUSIC KOREA Ltd. A Time Warner Company. Manufactured by SKC incooperation with HWA EUM Record Co., Ltd. Registration No. 275 to the Ministry of Culture & Sport Made in Korea. 9302-L7036-L7051(I) 93-669 Warning : All rights reserved. Unauthorized duplication". The usual text "THIS COMPILATION" has also been removed from under the track listing on the back cover. On the spine, the title, Catalogue number and "WARNER BROS" text has Not been printed in bold unlike the European pressing, "WARNER BROTHERS" has also been abbreviated to show just "WARNER BROS". The actual disc itself is silver with black printed text and is completely different compared to the first release which came with a light blue disc with beige text. The title "HEADLINES AND DEADLINES" is displayed at the top in bold with "THE HITS OF A-HA" underneath. 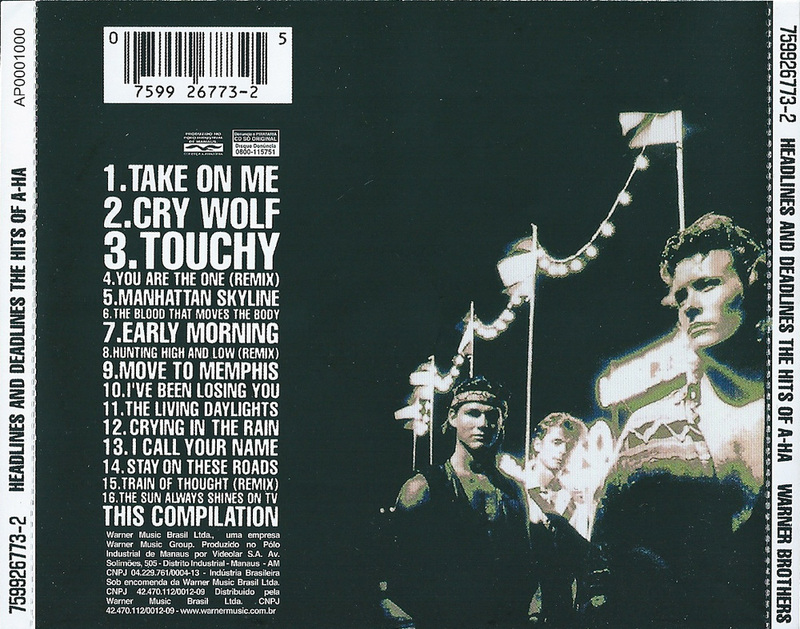 The track listing is shown instead down the left hand side, two of the tracks "THE BLOOD THAT MOVES THE BOOY" and "CRYING IN THE RIAN" have in fact been spelt incorrectly on the disc. On the right hand side of the disc is the "WARNER BROTHERS RECORDS" and "COMPACT DISC DIGITAL AUDIO" logo's. The European Catalogue 7599-26773-2 number used for this korean second pressing is shown at the lower centre of the disc. Displayed around the top edge of the disc is some Copyright information, whilst at the bottom outer edge is some Manufacturing information which reads "MANUFACTURED BY SKC IN COOPERATION WITH HWA EUM RECORDS CO. LTD. REGISTRATION NO.275 TO THE MINISTRY OF CULTURE. DISTRIBUTED BY WARNER MUSIC KOREA LTD. A TIME WARNER COMPANY". 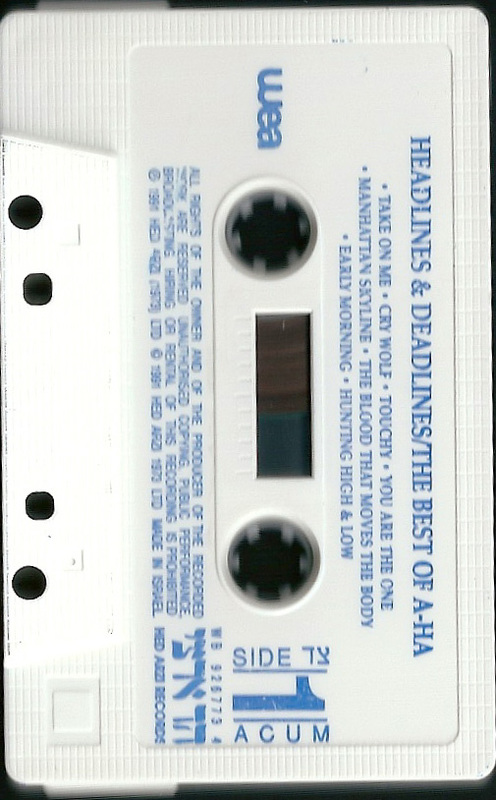 The Korean cassette of "Headlines And Deadlines" differs slightly compared to the German made European release and comes in at least three slightly different variations. The same regular front cover artwork is used on all, but the band member picture has been relocated much nearer to the top of the sleeve, in order to include a navy blue strip along the bottom. 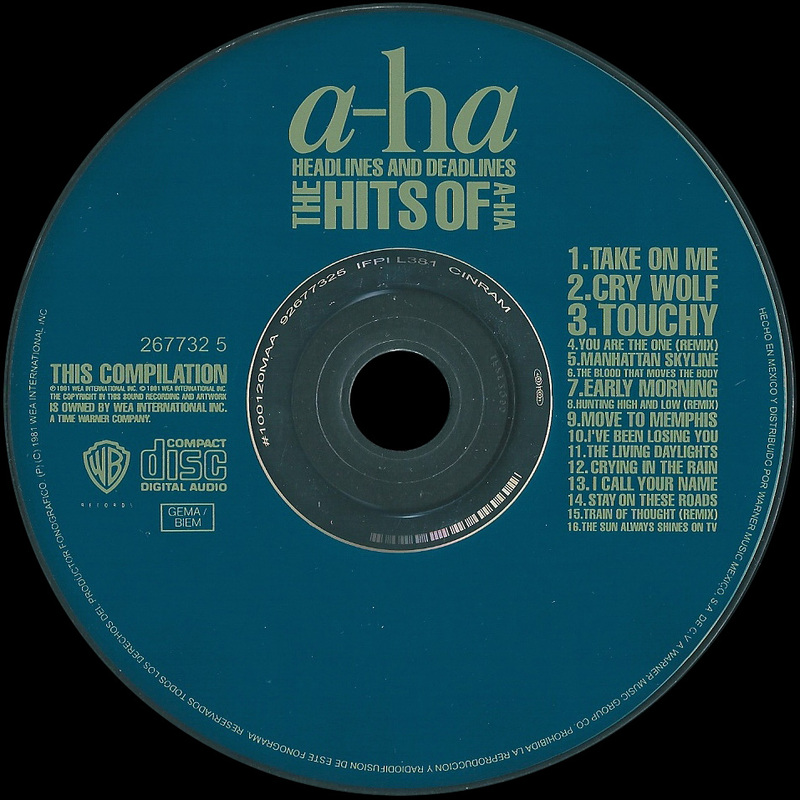 The layout of the title at the bottom right hand corner is smaller and shows the a-ha logo in cream (rather than beige), with "HEADLINES & DEADLINES" in dark blue (rather than light blue) and "THE HITS OF A-HA" in the usual white. 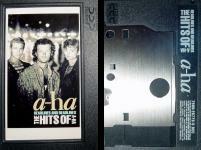 All three variations of the cassette include a fold-out sleeve. The first issue comes with a blue spine with white printed text. 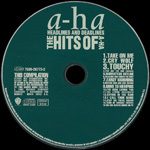 The title "HEADLINES AND DEADLINES THE HITS OF A-HA" is shown landscaped in the centre with a-ha being displayed to the left and printed in Korean. The "WB" logo is additionally shown oriented at the bottom. 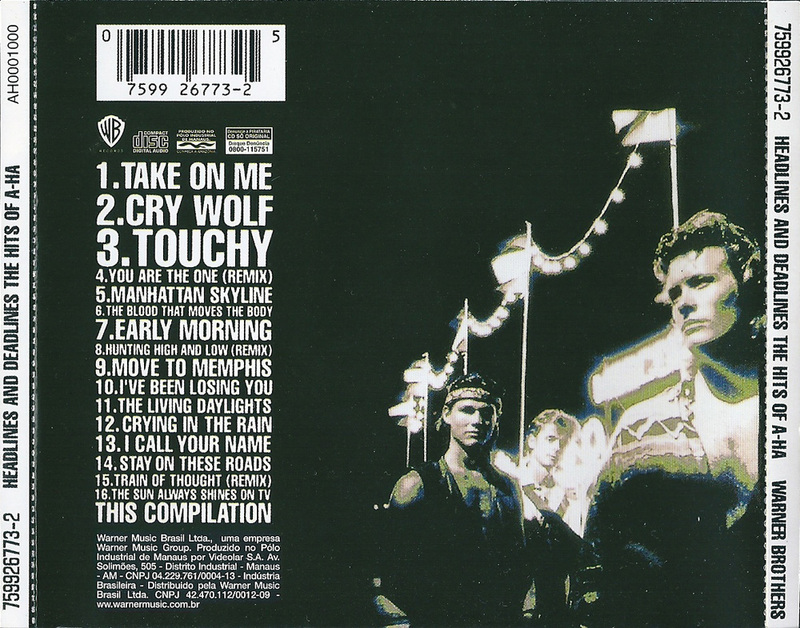 The back sleeve comes without a barcode and displays the full track listing including track lengths down the left hand side for side A and down the right hand side for side B. There is some Distributing, Manufacturing and Copyright information included underneath along the bottom; "Distributed by WARNER MUSIC KOREA Ltd. A Warner Music Group Company. Manufactured by HWA EUM Records Co. Ltd. Registration No. 275 to the Ministry of Culture & Sports. Made in Korea. (‘95. 10. 4) 9302-L7036-L7051 (D) 93-669 (’93. 3.10) Warning: All Rights Reserved. Unauthorized Duplication is a Violation of Applicable Laws". The Standard European Catalogue number 7599-26773-4 is also shown. The tape itself is off white and comes with a light grey stickered label and blue printed text. 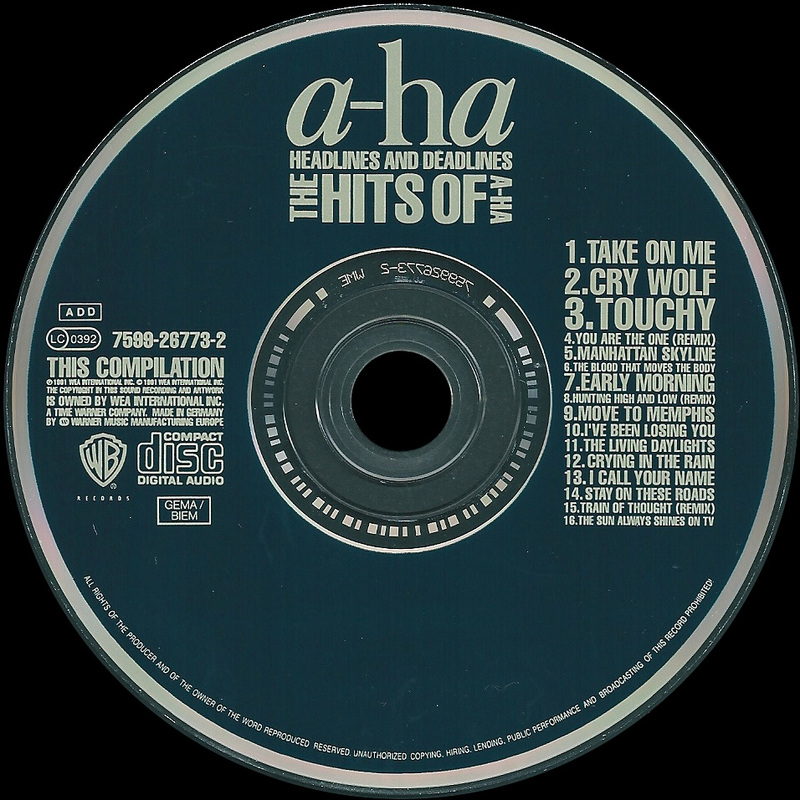 Along the top is "A-HA" with the track listing shown underneath to each side. On the left hand side is the "WARNER MUSIC KOREA" logo with Side "A/B" on the right. Displayed along the bottom of each side is some Manufacturing Information; "MANUFACTURED BY HWA EUM RECORDS LTD". There is another edition of the cassette which again comes without a barcode and is very similar to the earlier first issue. The colouring of the title on the spine has been changed and is now printed and displayed in pink instead of the previous white. The tape is also virtually the same as the earlier issue with the light grey and blue stickered label showing the exact same layout and design, but is now coloured plain white rather than off-white. An additional "Warner Music" silver logo has also been added on the clear centre part, in-between both cogs to each side. There is a third pressing of the cassette which is similar to the second edition including the same Pink text used on the spine, but the release now includes a white barcode on the back sleeve. 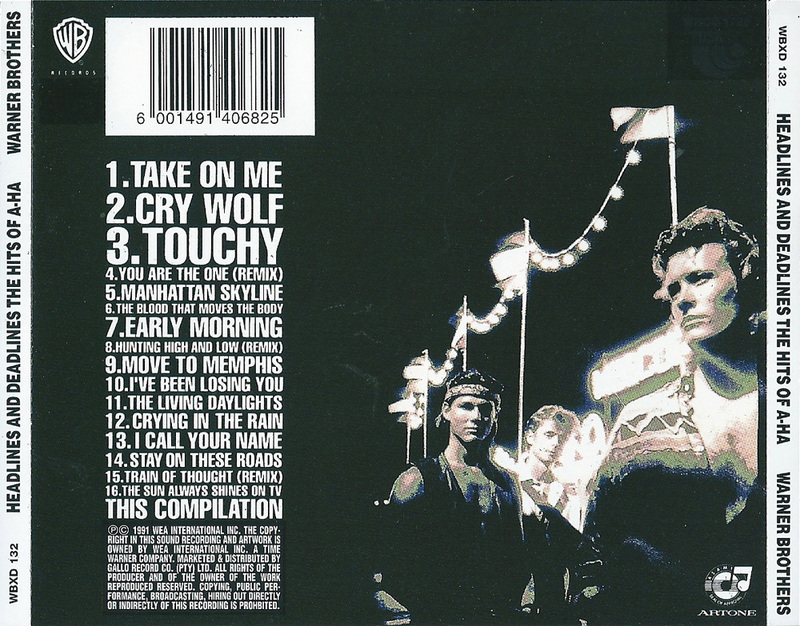 The track listing including track lengths, comes with a slightly different layout and font size compared to both earlier releases, Side "A" is listed on the left hand side of the barcode, with Side "B" on the right hand side. The Distributing and Manufacturing information is now displayed all in Korean. 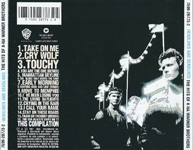 Unlike the earlier editions, both the Catalogue number and Copyright Information have been omitted from the back sleeve. The tape itself is exactly the same as the second edition coming with a plain white tape with the light grey stickered label and blue printed text. The silver "Warner Music" logo in-between both cogs is again included. The Malaysian cassette differs slightly compared to the European release, it was duplicated by "Tatik". All of the text on the sleeve is white rather than some of it being in beige and light blue. Although this release has the same catalogue number as the European release, the additional numbers WX450C and WE491 are not present. On the reverse, there is a small white sticker with black text displaying a Malaysian record company address; "Diedarkan oleh WARNER MUSIC (MALAYSIA) SDN BHD 9TH FLOOR, MUI PLAZA (BOX#18) JALAN P RAMLEE, 50250 KUALA LUMPUR BUATAN MALAYSIA". 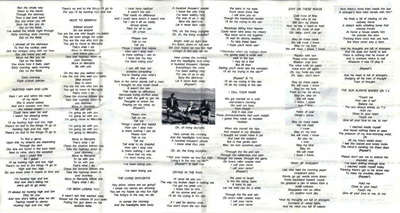 The inside of the fold-out sleeve on side 2, additionally shows that the cassette was Printed by: "Percetakan Cergas (M) Sdn Bhd Buatan Malaysia". The cassette itself is transparent/grey with white text and includes an edited catalogue number 26773-4 plus the Warner logo. Some copies also display the Warner Music Group logo, which has also been engraved into the centre part of the tape in-between the spools of each side, and on the actual back of the cassette case itself. The Mexican CD release comes with the regular front and back cover artworks printed in the usual three different colours. On the back cover at the bottom left hand corner we have some Spanish Manufacturing and Copyright information which reads "MAY IMPORTANTE Este fonograma es una obra intelectual protegidas en favor de su productor Derechos protegidas (P) (C) 1981 WEA INTERNATIONAL INC. DERECHOS RESERVADOS La titularidad de los derechos contenidos en este fonograma se encuentra reconocida y protegida conforme a la Ley. SE PROHIBE SU COPIA O REPRODUCCION PARCIAL O TOTAL AUN DE CARACTER PRIVADO SU ALQUILER Y SU EJECUCION PUBLICA POR CUALQUIER MEDIO. Estas prohibiciones estan penadas conforme a los Articulos 424 Fraccion lll del Codigo aplicables, vigentes, incluyendo las de caracter internacional. Hecho en Mexico y distribuido por WARNER MUSIC MEXICO S.A. DE C. V. a WARNER MUSIC GROUP CO MARCAS REGISTRADAS PARA SU VENTA EN MEXICO - Leibnitz No 32 Coi Nueva Anzures. C P 11590 Mexico. D.F. Tel 729-38-00". There are two slightly different pressings known to exist. The first pressing includes a silver "FLAPF" hologram sticker on the front of the CD case, it comes with a dark blue coloured disc with cream text and is very similar to the European release, it was made by Sonopress. Some copies come with the additional text "ORION CD CLUB 924-30-14" printed in black at the lower half of the disc. Around the outer edge of the disc is some Spanish Manufacturing and Copyright information:- "HECHO EN MEXICO Y DISTRIBUIDO POR WARNER MUSIC MEXICO, S.A. DE C.V A WARNER MUSIC GROUP CO. PROHIBIDA LA REPRODUCCION Y RADIODIFUSION DE ESTE FONOGRAMA, RESERVADOS TODOS LOS DERECHOS DEI. PRODUCTOR FONOGRAFICO. (P) (C) 1981 WEA INTERNATIONAL INC". 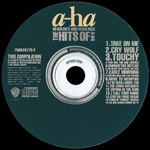 The second pressing comes instead with a silver "ifpi" hologram sticker on the front of the CD case. the colour of the disc is more of a lighter shade of blue than the first pressing, it was made instead by CIMRAM and comes with the same layout and design as the first pressing. The same Catalogue number is used on both pressings 267732 5, but differs from the usual European Catalogue number. The cassette differs slightly from the European release, it comes with the usual fold out sleeve but all of the text is printed in white instead of the three usual colours beige, blue and white. 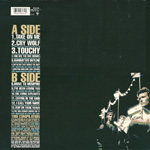 There are at least two slightly different pressings which come with a different layout to the back cover. The first pressing doesn’t include a barcode and has a black back cover with white text to match the rest of the sleeve. 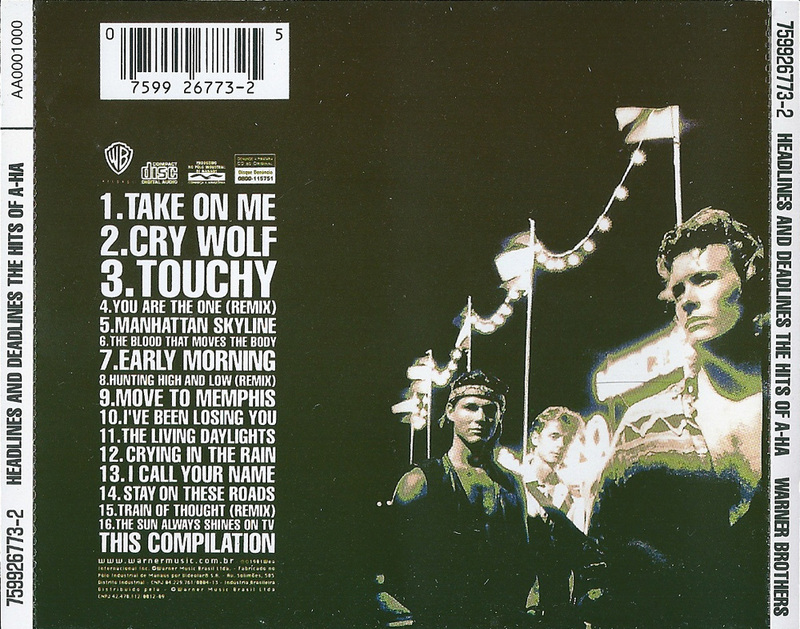 The track listing is displayed landscaped in Spanish along the top for both sides 1 & 2 with some additional Spanish Manufacturing and Record Company information included underneath; "(P) 1991 WARNER BROS. RECORDS (C) 1991 WARNER BROS. RECORDS. Hecho en Mexico por WARNER MUSIC MEXICO S.A. DE C.V. Acapulco No. 37 Mexico, 06140 Tel. 553-66-88 A TIME WARNER COMPANY MARCAS REGISTRADAS PARA SU VENTA EN MEXICO". At the bottom of the spine it displays the "DOLBY SYSTEM", "Round OO2" and "WARNER MUSIC MEXICO" logos. The Catalogue number CXMB-7180 is also shown. On the inside of the folded insert on side 2, it again additionally shows the Catalogue number along with some Spanish Manufacturing and Copyright information which reads; "CXMB-7180 MUY IMPORTANTE este fonograma es una obra intelectual protegida en favor de su productor ℗ 1991 WARNER BROS RECORDS. © 1991 WARNER BROS RECORDS. Derechos reservados HECHO EN MEXICO POR WARNER MUSIC MEXICO, S.A. DE C.V. ACAPULCO No. 37 MEXICO 06140, D.F. TEL. 553-66-88 A TIME WARNER COMPANY MARCAS REGISTRADAS La titularidad de los derechos contenidos en el fonograma se encuentra reconocida y protegida CONFORME A LA LEY SE PROHIBE SU COPIA O REPRODDUCCION PARCIAL O TOTAL. SU ALQUILER Y SU EJECUCION PUBLICA. Estas prohibiciones estan penadas conforme a los Articulos 386 del Codigo Penal y 135 y 136 de la Ley Federal Sobre el Derecho de Autor y demas normas legales aplicables vigentes". The second pressing comes again with the exact same front cover and spine as the first pressing but the back cover is different to include instead a plain white sleeve with black printed text; the layout is also different with the Spanish track listing now being shown down the left and right hand sides, there is also an additional white barcode included in the centre. Along the bottom of the back cover is the exact same Manufacturing and Record Company information which appears on the earlier pressing; "(P) 1991 WARNER BROS RECORDS (C) 1991 WARNER BROS RECORDS Hecho en Mexico por WARNER MUSIC MEXICO, S.A. DE C.V. Acapulco No. 37 Mexico, 06140 Tel. 553-66-88 A TIME WARNER COMPANY MARCAS REGISTRADAS PARA SU VENTA EN MEXICO". The inside of the folded insert comes with the regular album artworks as before and again additionally includes the Mexican Catalogue number CXMB-7180, plus same Spanish Manufacturing and Copyright Information printed on side 2. Both pressings appear to come with the same tape which is transparent/grey with white printed text, the title "A-HA HEADLINES AND DEADLINES" is shown at the top with the full track listing for each side displayed all in Spanish underneath. The usual "WB" logo is shown on the left hand side and the Catalogue number on the right hand side. At the bottom of side 1, there is some Spanish Production information; "(P) 1991 WARNER BROS. RECORDS UNA COMPANIA DE TIME WARNER COMPANY HECHO EN MEXICO" and on side 2, there is some Spanish Copyright information "(C) 1991 WARNER BROS. RECORDS EL IMPORTE PAGADOPOR ESTE FONOGRAMA NO AUTORIZA SU EJECUCION PUBLICA CON FINES DE LUCRO". The German made CD released in Norway has a slightly different catalogue number to that released in the UK. 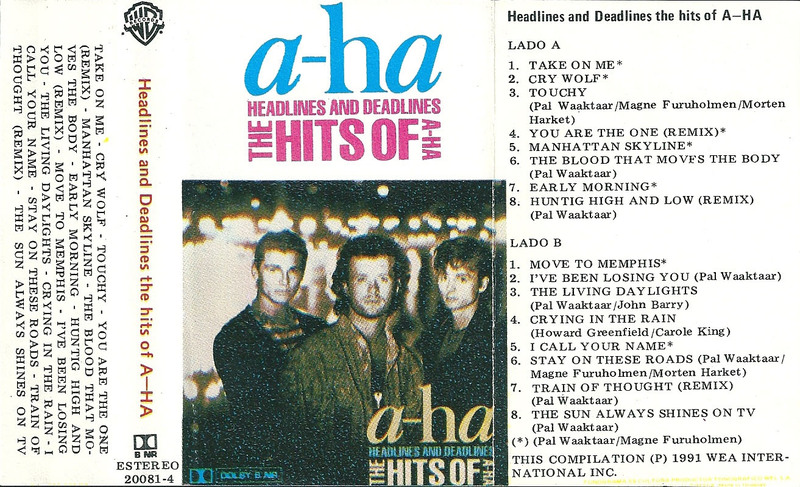 The cassette release from Peru looks unofficial, there appears to be a couple of slightly different variations of it, both come with a single sided folded insert with the regular cover artwork printed in colour in the middle of the front sleeve, the remainder is in plain white with the title "HEADLINES AND DEADLINES THE HITS OF A-HA" in black type-font text. Along the bottom, there is some Manufacturing information which reads "FABRICADO POR “EL VIRREY” INDUSTRIAS MUSICALES S.A. R.I. 12428". The title is printed in red on the spine, but the actual "WB" logo on the first edition is somewhat smaller compared to that on the second edition, it also doesn't include the word "RECORDS" after the logo. The full track listing is included on the fold-out part of both editions, printed in both Spanish and English. The back sleeve on the first edition is white, whilst on the second edition, it is instead light blue. The layout on both is otherwise exactly the same. 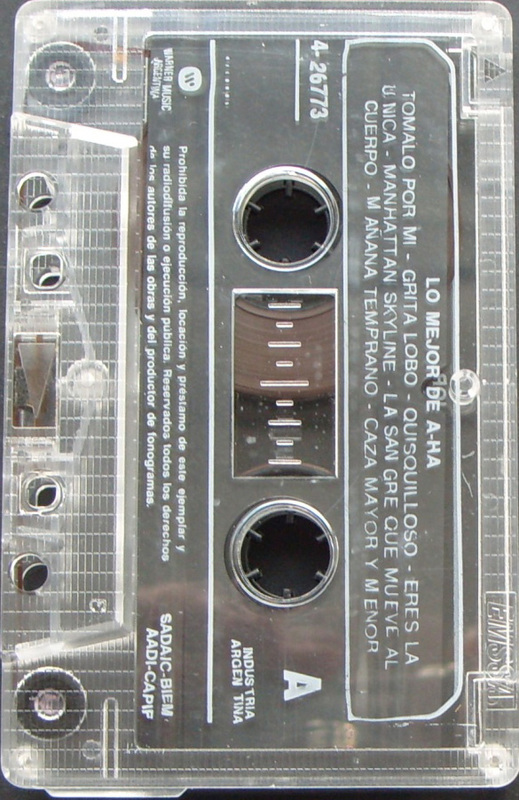 Under the track listing on the back sleeve, there is a picture of a cassette tape with crossbones displaying some Spanish Copyright Warning information "Estos fonogramas estan protegidos en favor de su productor conforme a Ley. Prohibido el alquiler, reproduccion y comunicacion publica sin la autorizacion escrita de su productor fonografico. Toda violacion esta penada por los articulos 216 y siguientes del Codigo Penal. La adquisicion de este ejemplar no faculta su explotacion". The tape on both editions is the same, transparent clear with white stickered paper labels and black printed text, the title is displayed along the top with the "WB" logo shown in the top left hand corner, the wording "RECORDS" is displayed within the logo on the first edition, but is displayed afterwards on the second one. Along the bottom there is some Spanish Copyright and Manufacturing information which reads "QUEDAN RESERVADOS TODOS LOS DWEECHOS DEL AUTOR Y DEL PRODUCTOR DE FONOGRAMAS ESTA PROHIBIDA LA COPIA. LOCACION Y EJECUCION PUBLICA DE ESTE FONOGRAMA. MANUFACTURADO POR "EL VIRREY" INDUSTRIAS MUSICALES S.A. - INDUSTRIA PERUANA - R.I. 12428". The Catalogue number CAN-WBR 0267734.9 and "STEREO" are also included. The Philippines CD release of "Headlines And Deadlines" differs slightly from the European release. The front and back sleeves are similar to the European release, except for the text in the right hand corner of the front sleeve is printed in white rather in three colours and all text on the back sleeve is in white. Also, all of the internal booklet text is also printed in white. The actual disc is dark blue with a large orange a-ha logo at the top. The remainder of the text is printed in silver, set out in a similar way to that on the European release. The CD was manufactured and distributed by Warner Music Philippines. The Philippines 1st pressed cassette comes with a tinted tape with a light blue stick-on label and black printed text, the "DOLBY SYSTEM" logo and track listing is displayed at the top and "a-ha HEADLINES AND HEADLINES THE HITS OF A-HA" at the bottom. On the left hand we have a round "PARI MEMBER APPROVED" symbol, whilst on the right hand side; there is the "WB Records" logo, Catalogue number and "STEREO". The folded insert is very similar to the European release but all of the text is printed in white instead of the three usual colours. The Catalogue number on the spine has also been changed to use just the standard European number 7599-26773-4. On the back cover the Manufacturing information has also been changed to read "Manufactured in the Philippines for WEA Records under license from WEA International, Inc. U.S.A. A Warner Communications Company". The round "PARI MEMBER APPROVED" symbol and Catalogue number are additionally shown. The 2nd pressing comes instead with a clear tape with a white stick-on label and black text, the layout is different compared to the 1st pressing and doesn’t include the "PARI MEMBER APRROVED" symbol. 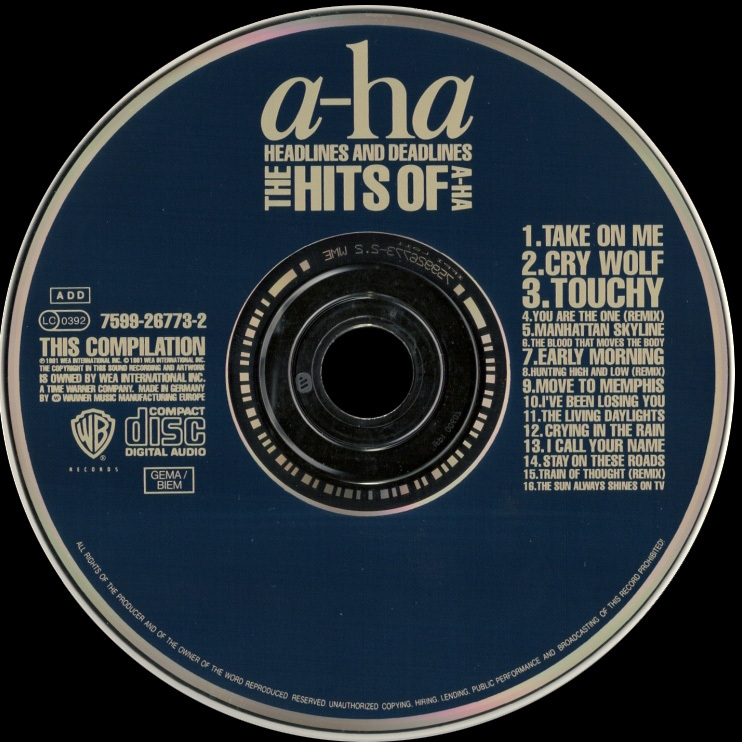 At the top it displays the a-ha logo and title "HEADLINES AND DEADLINES THE HITS OF A-HA", it also includes the text "SEE INLAY CARD FOR DETAILS". On the left hand side, we have the "WB Records" logo and a simplified Catalogue number 26773-4. Along the bottom it reads "MANUFACTURED & DISTRIBUTED BY WARNER MUSIC PHILLIPINES, A TIME WARNER COMPANY". The folded insert is very similar to the European release and includes all the text in the three usual colours beige, blue and white. 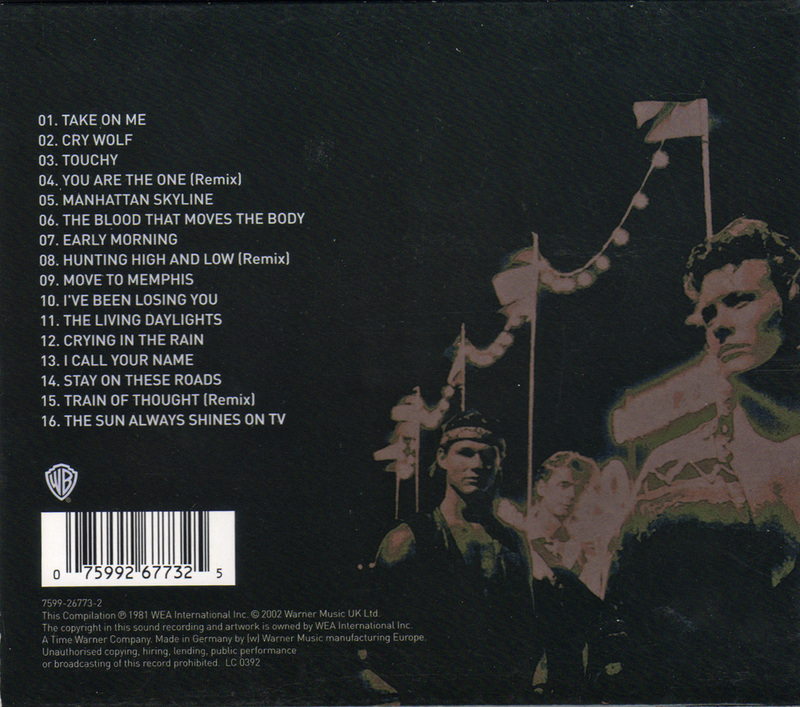 On the inside of the folded insert on side 2, it additionally includes the text "PHILIPPINE COPYRIGHT 1992 BY WARNER MUSIC PHILIPPINES, A TIME WARNER COMPANY". 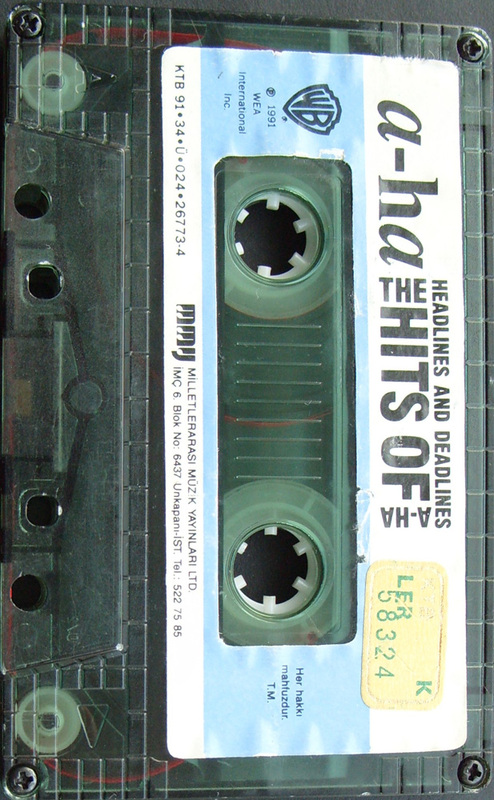 The same Philippines Manufacturing and Distributing information which appeared on the tape is additionally shown next to the barcode on the back cover. The Polish 1st pressed cassette release was Manufactured by "Polton" in Poland and uses the Catalogue number PCW-507. 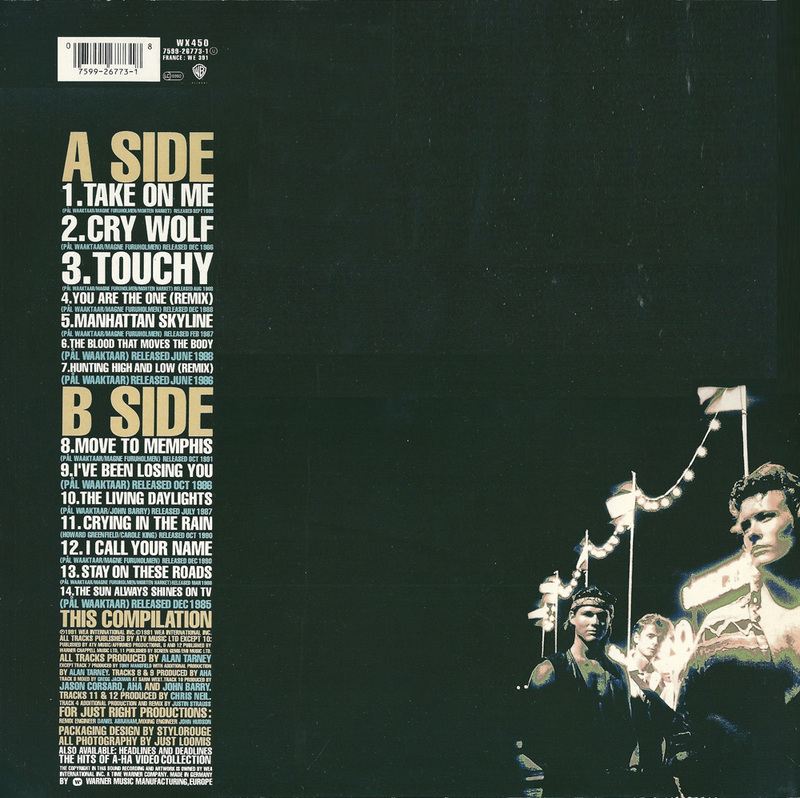 The front and back cover artworks on the folded insert is virtually the same as the European release, the text is also printed in the three usual colours beige, blue and white. The Catalogue number at the bottom of the spine includes the word "POLTON" and comes with a musical note symbol in the shape of a swirl. On the back cover above the barcode it additionally has printed in light blue "MANUFACTURED IN POLAND BY POLTON". The tape itself is transparent clear and comes with a grey centre piece; the layout is different compared to the European release. 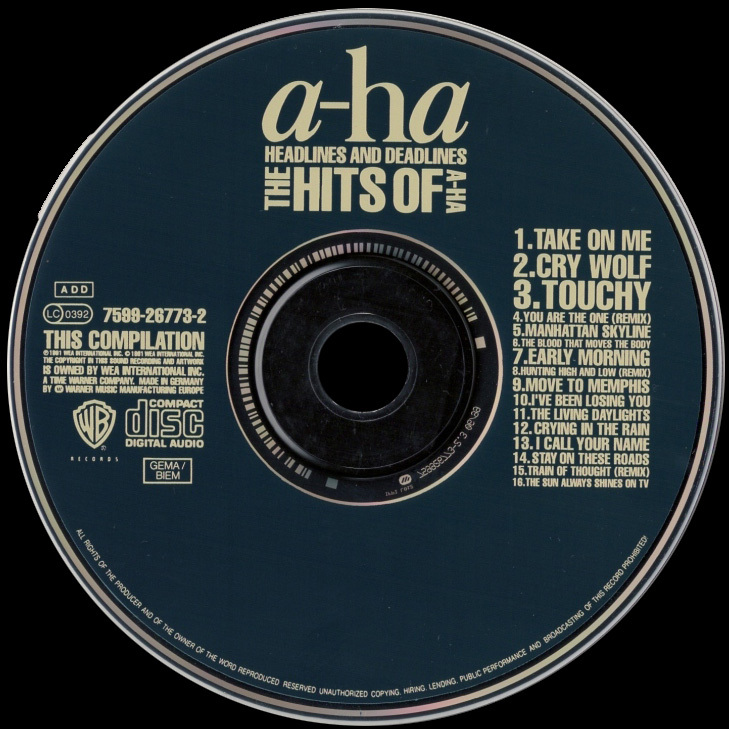 At the top, it displays the title "A-HA,,HEADLINES & DEADLINES – THE HITS OF A-HA" along with the track listing to each side underneath. On the left hand side we have the word ‘POLTON’ along with the musical note swirl symbol and Catalogue number, the "ZAIKS" logo is also included. On the right hand side it displays an A or B instead of the usual side 1 or 2. 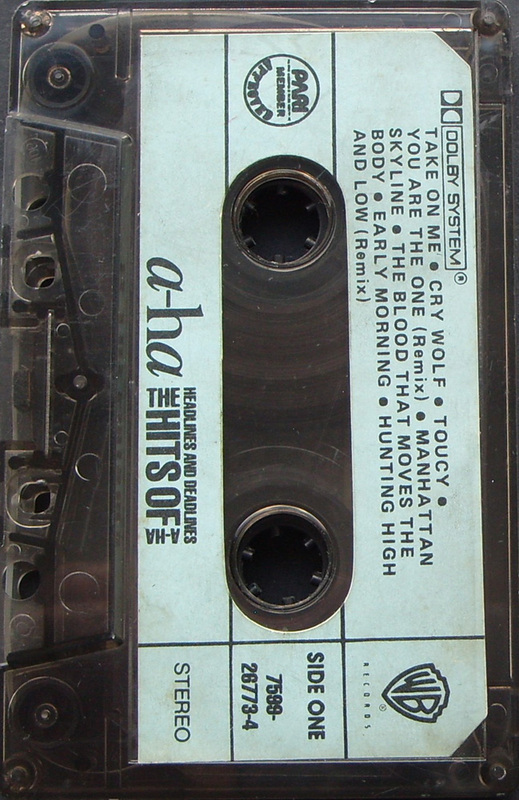 Along the bottom of Side A it displays some Copyright information and that the Cassette was "Manufactured in Poland by POLTON". 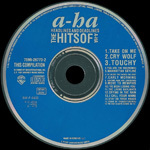 On Side B, the usual Record company information is shown which reads "The compilation (P) + © 1991 Warner Bros. Records Inc. for the U.S. & WEA International Inc. for the world outside of the U.S". There is a 2nd pressed Polish cassette which was again Manufactured by "Polton" in Poland but comes instead with the standard European Catalogue number 7599-26773-4. The front and back cover artworks are the same as the previous "Polton" release including the text being printed in the three usual colours. The release now comes with a square silver "ZPAV-ZAIKS" Compact Disc/Cassette Hologram sticker on the front cover. At the bottom of the spine it displays the "WARNER MUSIC POLAND" logo and Catalogue number 7599-26773-4. On the back sleeve above the barcode it again displays "Manufactured in Poland by Polton" but it has now been printed in white text rather than light blue. The tape is again transparent clear with a grey centre piece but the layout is different compared to the 1st Polton release. 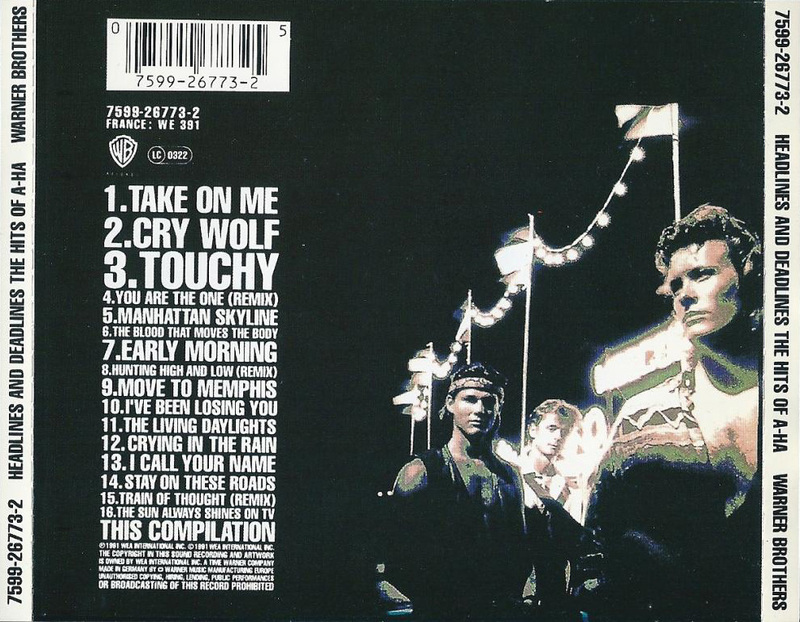 The title and track listing is shown at the top but in a slightly smaller font size. On the left hand side we now have the "WARNER MUSIC POLAND" logo and Catalogue number, whilst on the right hand side, it displays a smaller A/B in order to include the "Dolby-B NR" logo, "STEREO" and "ZAIKS". At the bottom of the tape it displays the same Copyright information as before but again in a smaller font, it however does not include the text "Manufactured in Poland by POLTON" which appeared on the 1st pressed tape. There is another Polish cassette pressing which was released instead by "Warner Music in Poland" and was "Manufactured in Poland by TAKT 146/FV", it comes again with the square silver "ZPAV-ZAIKS" Compact Disc/Cassette Tape Hologram sticker on the front cover. The folded insert in exactly the same as the European release apart from the Catalogue number at the bottom of the spine has been changed and over-dubbed to show just the "WARNER MUSIC" logo and the standard European number 7599-26773-4. The tape is again transparent clear with a grey centre piece but the layout and design is different compared to the earlier "Polton" releases. The title at the top has been printed and displayed along the same lines as on the front cover. On the left hand side, the "WARNER MUSIC POLAND" logo, "WB RECORDS" logo and Catalogue number are shown. On the right hand side it displays Side A/B in Polish to read "STRONA A/B", the "DOLBY STEREO ZAIKS/BIEM" text is also displayed. At the bottom of Side A, the Manufacturing and Copyright information has been printed all in Polish to read "WSZYSTKIE PRAWA PRODUCENTA I WŁAŚCICIELI PUBLIKOWANYCH UTWOROW ZASTRZEZONE. KOPIOWANIE, WYPOZYCZANIE I PUBLICZNE ODTWARZANIE BEZ ZEZWOLENIA ZABRONIONE. WYPRODUKOWANO W POLSCE PRZEZ TAKT 146FV". On Side B, the same information is shown but has now been translated into English. In Russia, the album was released as a set of two LP's. 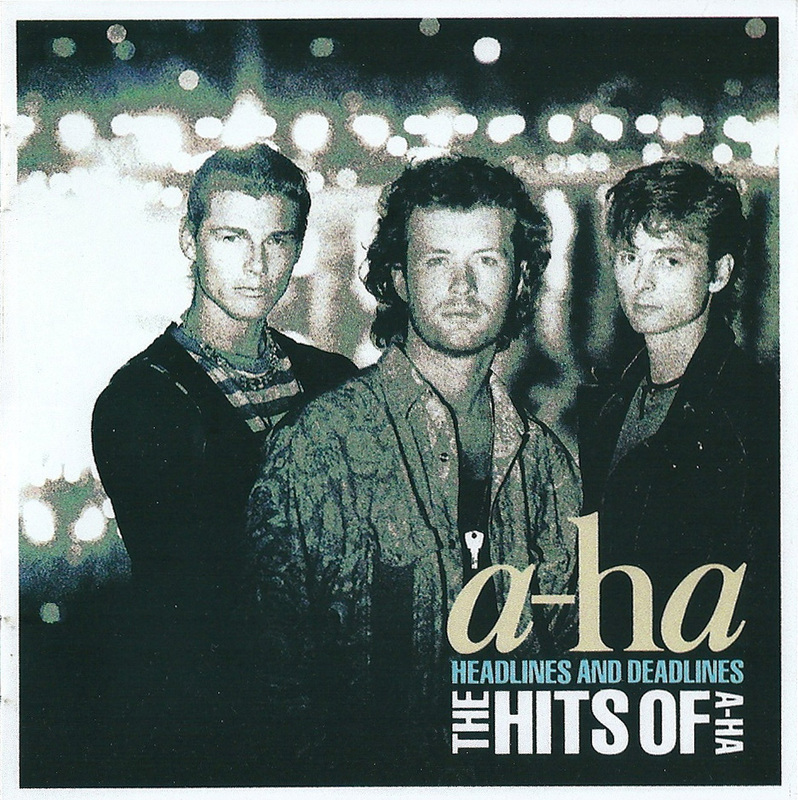 They come in individual sleeves which have covers similar to the regular European release of "Headlines And Deadlines" except for a circled 1 printed on the sleeve of the first LP and a 2 on the other. The reverse of the sleeves are also similar to that of the regular release but the titles are listed in a slightly different manner. The centre of the records have a pinkish red paper label which says "The Hits Of a-ha Headlines And Deadlines stereo 33 Volume 1 (/ 2)" The running order of the LPs are the same as the CD edition with "Manhattan Skyline" starting the second side of LP1, "Move To Memphis" starting LP2 and "I Call Your Name" starting the second side of LP2. The LP-set was released in October 1992. 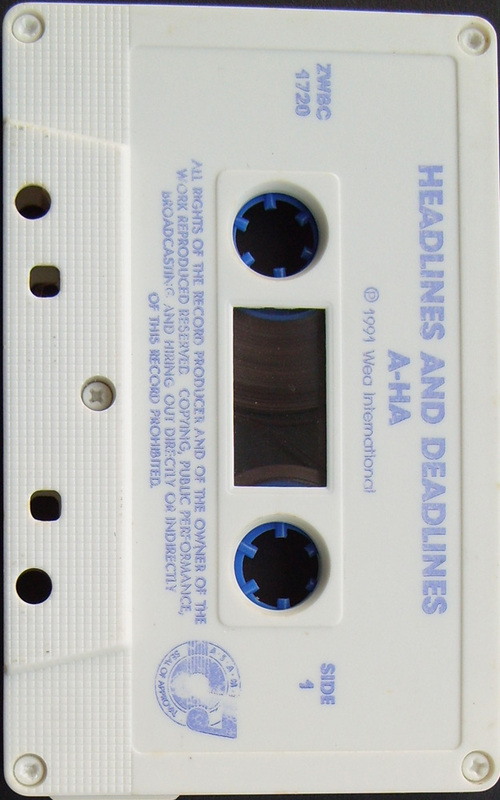 There was a Russian cassette of "Headlines And Deadlines" available in Russia. It was Manufactured by "НИКИТИН" and has a similar sleeve to the European release, but the title on the front cover and spine is printed in a darker blue. The release also includes the usual artworks on the folded insert displaying the text in the three colours; beige, blue and white. On the spine, the title has been printed slightly smaller than usual with the Catalogue number 7599-26773-4 at the top and the "WB" logo at the bottom, it also displays some Russian record company text "фирма грамзаписи НИКИТИН" and the "WWW.RECORDS.RU" website address. The track listing and white barcode on the back cover has again been printed and displayed slightly smaller and the "WB" logo has been relocated from the middle down to the bottom end. There is also some Russian Manufacturing and Copyright information including website addresses which read; "(P) & © 1991 WEA INTERNATIONAL INC. (P) 2002 фирма г рамэаписи НИКИТИН/WWW.RECORDS ALL RIGHTS RESERVED. E-MAIL: [email protected] ТЕЛ./ф. : (095) 310-10-76. эксклюзивной дистрибьютер MC, CD в россии/снг: торговая фирма НИКИТИН E-MAIL: [email protected] ТЕЛ./ф. : (095) 381-66-05". The tape is clear transparent with white text and red cogs. The title "a-ha THE HITS OF A-HA HEADLINES AND DEADLINES" is shown at the top with the track listing to each side underneath. At the top left hand corner we again have the "WWW.RECORDS.RU" website address and the Russian record company text "фирма грамзаписи НИКИТИН" at the top right. The Catalogue number and "WB" logo are displayed on the left hand side. Along the bottom of side A, we have some Russian "NITIKIN" Manufacturing and Record Company contact information which reads; "(P) 2002 фирма г рамэаписи НИКИТИН/ www.records Торговая фирма НИКИТИН (095) 381-48-80, 381-66-05 Bсе права эащищены". On side B at the bottom, it displays; "(P) & © 1991 WEA INTERNATIONAL INC. All rights reserved". Also included at the bottom of each side of the tape are the "DIGITAL MASTER" and "DOLBY HX PRO" logos. "Headlines And Deadlines" was re-issued in a card slipcase in 2003, click here for more details. There is a Russian re-issue of "Headlines And Deadlines" which was released by "Никитин" under exclusive license to Warner Music, the layout and artworks is similar to the European release, but comes with a slim obi-strip advertising the albums "Hunting High And Low" and "East Of The Sun West Of The Moon". The title on the spine is shown in the usual light blue but comes without an "S" at the end of "Headlines". On the front of the obi-strip which is white with black text, it includes a gold rectangular at the top with the Russian wording "ВКЛЮЧАЕТ ХИТЫ:" which translates "Includes Hits:" Take On Me, Stay On These Roads and Crying In The Rain are also shown underneath in light blue. There is also some further Russian text printed in black which reads:- "«ПО СРАВНЕНИЮ СО СВОНМИ КОНКУРЕИТАМИ BROS И ДРУТИМИ БОЙ-БЕНДАМИ ТОГО ВРЕМЕНИ, ЗВУЧАЛИ БОЛЕЕ ЕСТЕСТВЕННО И ИСКРЕННЕ, ПО ДУХУ ОНИ ВСЕГДА БЫЛИ БЛИЗКИ К ABBA. ИМЕННО ИСКРЕННОСТЬ И СДЕЛАЛА ИХ ПЕСНИ НЕСТАРЕЮЩИМИ ХИТАМИ» (AMAZON). СБОРНИК ЛУЧШИХ ХИТОВ, ОХВАТЫВАЮЩИЙ ПЕРВЫЙ ЭТАП В ТВОРЧЕСТВЕ НОРВЕЖСКОГО ТРИО, ДИСК ПОДНЯЛСЯ НА ДЕВЯТУЮ СТРОЧКУ ЧАРТА НОРВЕГИИ, И СТАЛ ДВЕНАДЦАТЫМ В СОЕДИНЕННОМ КОРОЛЕВСТВЕ, ПОЛУЧИВ «ПЛАТИНОВЫЙ» СТАТУС. ТИРАЖ АЛЬБОМА СОСТАВИЛ БОЛЕЕ ДВУХ МИЛЛИОНОВ КОПИЙ". When translated it reads: "Compared with its competitors BROS and other boy band of the time, it sounds more natural and sincere, in spirit they have always been close to ABBA. Just sincerity and it makes them songs timeless hits. (Amazon)". 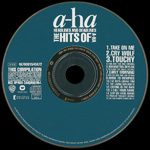 "Greatest hits compilation, covering the first stage in the work Norwegian trio, CD climb to ninth place NORWAY charts, and became the twelfth in the United Kingdom, received the "Platinum" status. Edition of the album has made more than two million copies". The album comes with the same European booklet but doesn't include the Catalogue number on the back cover. The disc itself is plain blue with white text, some further Russian Record Company text "Издатель: 000 «фирма грамзаписи «Никитин». по зксклюзивной лицензии «Warner Music». Все права защищены" is displayed on the left hand side of the disc. The "Warner Brothers" and "Никитин" logo's is also included. On the back cover the white barcode comes with a different number 4670001545372 compared to the European release. The "Warner Brothers" and "Никитин" logo's are again on show. Displayed at the bottom of the back cover in gold text is some Russian Record Company, Contact details and Website addresses. It also advises "Not to expose to mechanical or magnetic influence and avoid direct sunlight and moisture". The release also comes with a different Catalogue number 4670001545372. 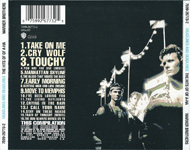 The Singapore cassette release is very similar to the European release, it comes with the same front and back cover artworks on the folded insert including displaying all of the text in the three usual colours. The European Catalogue Numbers WX450C, 7599-26773-4 and FRANCE WE391 are displayed on the spine and additionally on the back cover above the barcode. 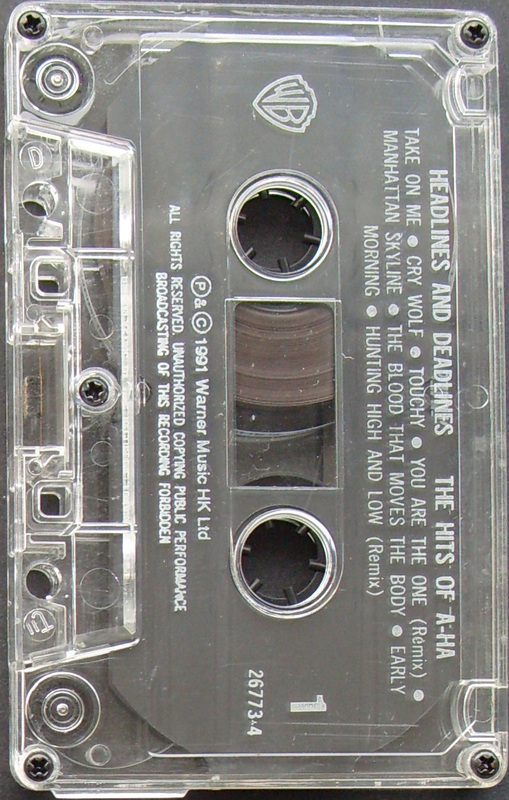 On the inside of the folded insert on side 2, there is some additional Manufacturing and licensing information which reads "Manufactured in Singapore under licence from Warner Music Singapore Pte Ltd. No licence is granted or is to be implied by the sale or supply of this cassette or container thereof under or in relation to any trademark or owned by Warner Music Singapore Pte Ltd anywhere in the world outside Singapore". 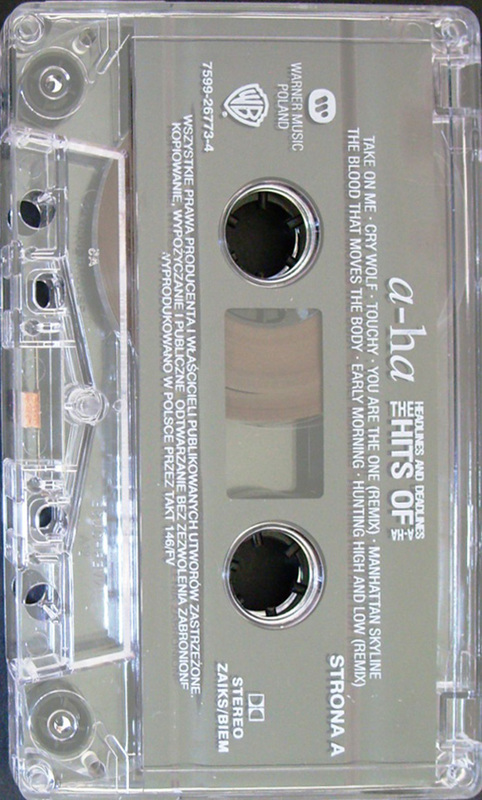 The tape is transparent clear with a grey centre, it displays the title "HEADLINES AND DEADLINES THE HITS OF A-HA" at the top with the track listing to each side underneath. 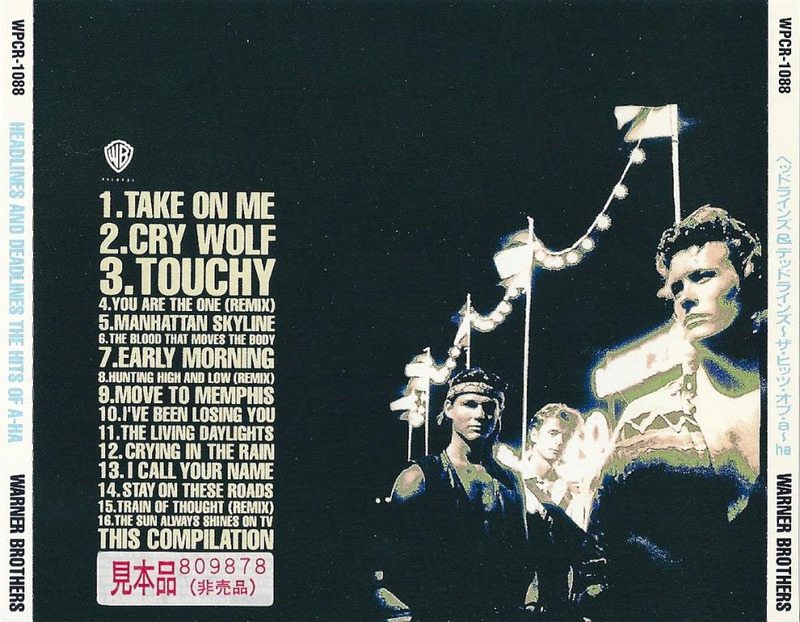 At the bottom it shows some Production and Copyright information "(P) & (C) 1991 Warner Music HK Ltd. ALL RIGHTS RESERVED. UNAUTHORISED COPYING PUBLIC PERFORANCE BROADCASTING OF THIS RECORDING FORBIDDEN". The usual "WB Records" Logo and Catalogue number 26773-4 are also included. On the back of the actual cassette case it comes with a large "Warner Music Group" logo engraved onto the plastic. 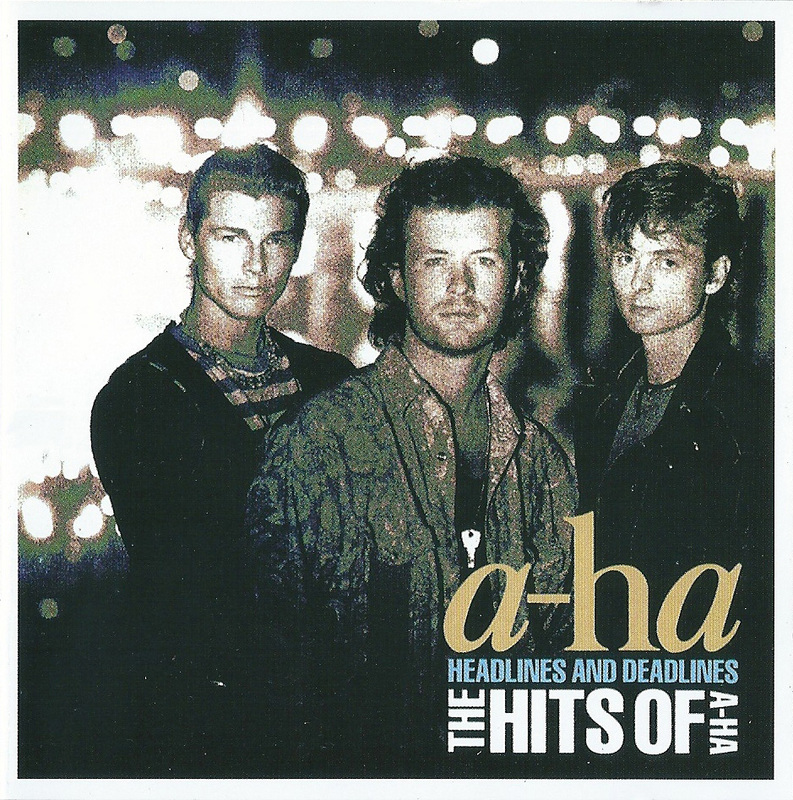 The South African CD release of "Headlines And Deadlines" differs slightly from the European release. The front and back sleeves are similar to the European release, except for the text in the right hand corner of the front sleeve is printed in white rather than in the three colours, all text on the back sleeve and on the inside of the booklet is also in white. The first presssing comes with the Catalogue number WBCD 1720 and the actual disc is silver with a large orange a-ha logo at the top. The remainder of the text is printed in black, set out in a similar way to that on the European release. The CD was manufactured by CDT in South Africa and displays that it was "MARKETED & DISTRIBUTED BY TUSK MUSIC CO. (PTY) LTD". The second pressing comes with a different Catalogue number WBXD 132 compared to the first South African release, the disc is again silver with a more peachy coloured a-ha logo at the top rather than orange. The remainder of the text is now coloured light green instead of the previous black, the layout is virtually the same as the first release apart from some of the logo's are now displayed slightly smaller. This second CD release was also manufactured by CDT in South Africa and again show that it was "MARKETED & DISTRIBUTED BY TUSK MUSIC CO. (PTY) LTD". The South African LP release comes with the same front cover artworks as the German pressing, but the title "a-ha HEADLINES AND DEADLINES THE HITS OF A-HA" at the bottom right hand corner is displayed all in white instead of the three usual colours. The track listing on the reverse of the black sleeve is also shown in white down the left hand side. There is a much larger white barcode shown in the top left hand corner and comes with a different number; "6 001491 203615". The catalogue number WBC 1720 is included in the top right hand corner, along with the text; "Also available on: MC ZWBC 1720 CD WBCD 1720" with the catalogue numbers shown for both the cassette and CD release. The "TUSK MUSIC CO (PTY) LTD" logo is also displayed. 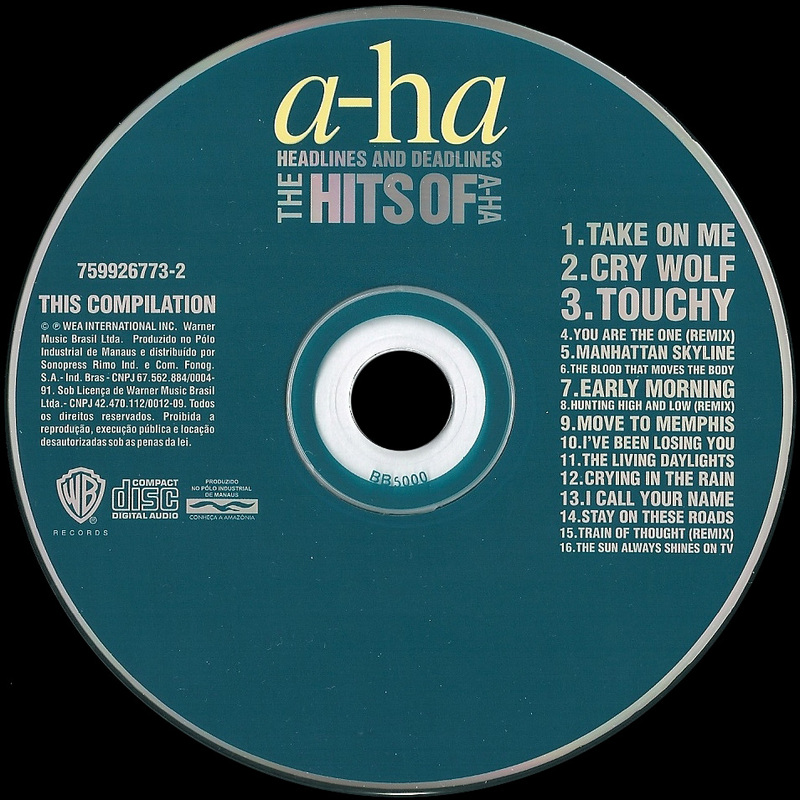 At the bottom left hand corner, the "A.S.A.M.I SEAL OF APPROVAL" Musical Note symbol is additionally included, whilst at the bottom right hand corner underneath the artworks taken from the "Move To Memphis" single, it displays the regular "WB Records" logo plus some marketing, distributing and copyright information; "THE COPYRIGHT IN THIS SOUND RECORDING AND ARTWORK IS OWNED BY WEA INTERNATIONAL INC. A TIME WARNER COMPANY ℗ 1991 Wea International. Marketed and Distributed by Tusk Music Co (Pty) Ltd. All rights of the record producer and of the owner of the work reproduced reserved. Copying, public performance, broadcasting and hiring out directly or indirectly of this record is prohibited". The "ARTONE" logo is also displayed. 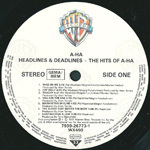 The record comes with white labels and black printed text, the colour "WB Records" logo is displayed at the top with the title "A-HA HEADLINES AND DEADLINES" in bold underneath. On the left hand side, it displays "(WBC 1720 A/B)" with production text; "℗ 1991 Wea International", and on the right hand side, it includes the catalogue number in bold; "WBC 1720" and "33,3 rpm". 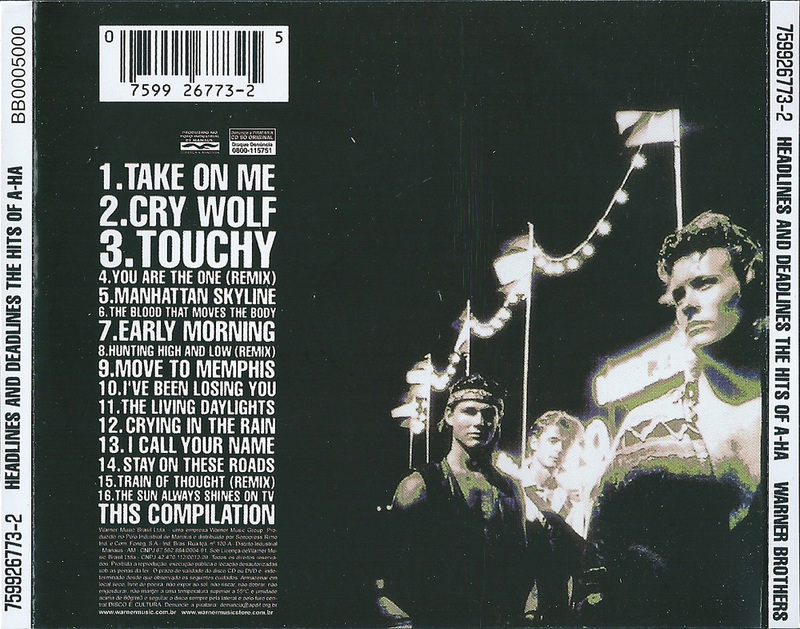 The full track listing is shown at the lower half of the label for each side and includes the track credits and track lengths. The track lengths are again printed in bold. There is some manufacturing and distributing information displayed at the bottom of each side which reads; "MANUFACTURED & DISTRIBUTED BY TUSK MUSIC COMPANY (PTY) LTD A licensee of WEA International Inc.". Also included around the outer top edge of the label is some copyright text; "ALL RIGHTS OF THE MANUFACTURER AND OF THE OWNER OF THE RECORDED WORK RESERVED. UNAUTHORISED PUBLIC PERFORMANCE BROADCASTING AND COPYING OF THIS RECORD PROHIBITED". The South African cassette release comes with a similar folded insert to the European release but the text on the front and back cover is shown in white instead of the three usual colours. The Catalogue number ZWBC 1720 is displayed at the top right hand corner of the front sleeve. 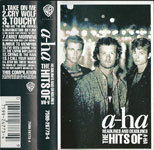 On the spine the title "a-ha HEADLINES THE HITS OF A-HA" is shown in the centre with the "WB Records" logo at the top and the "TUSK" logo and Catalogue number at the bottom. 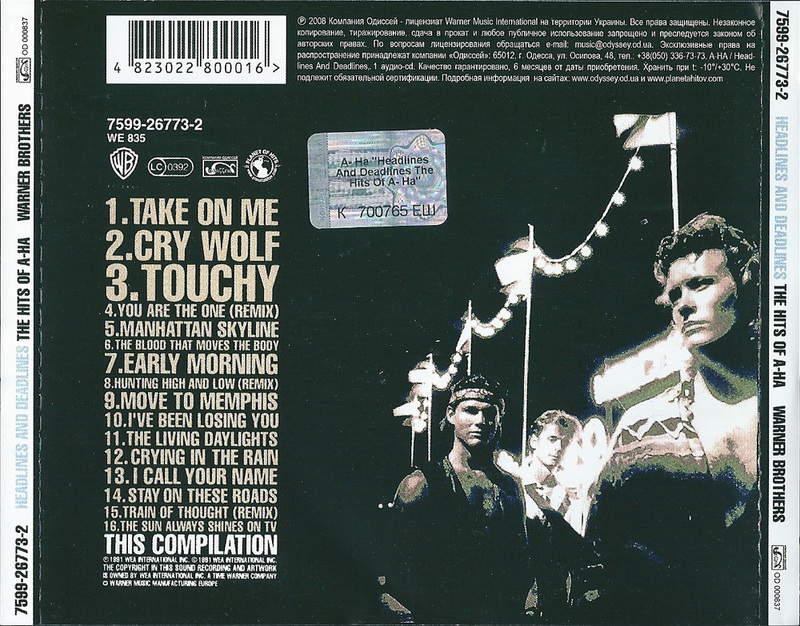 The back cover comes with a black background with a large white barcode displayed in the centre, the track listing is printed on the left hand side in white for Side 1 and on the right hand side for side 2. The word "ARTONE" is additionally shown at the bottom right hand corner. 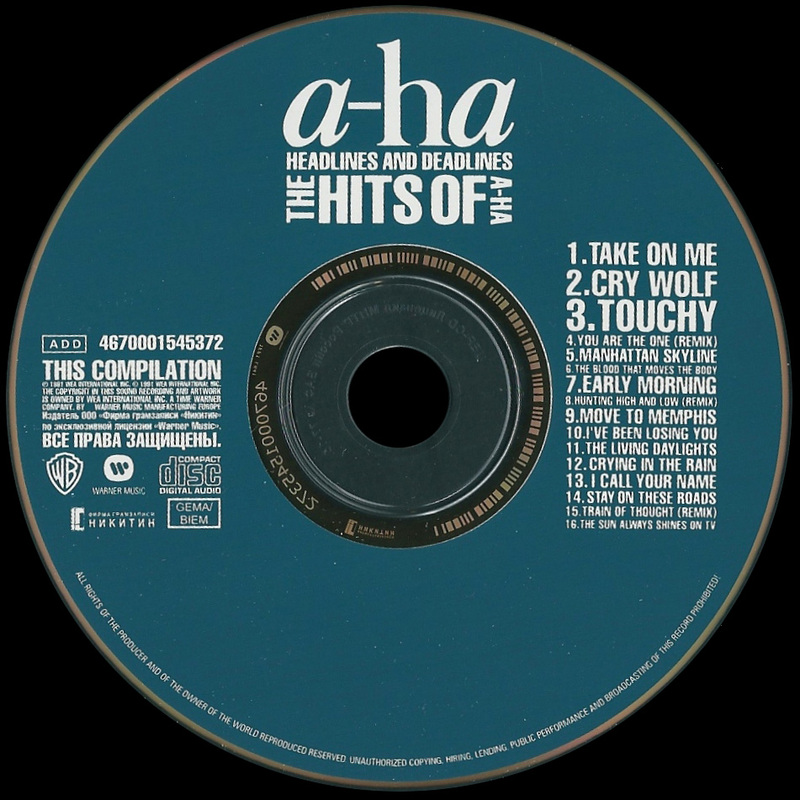 On the inside of the folded insert on side 1, the usual track listing has again been printed all in white, it additionally includes the "A.S.A.M.I SEAL OF APPROVAL" Musical Note symbol at the bottom. On side 2 of the folded insert underneath the "ALSO AVAILABLE: HEADLINES AND DEADLINES THE HITS OF A-HA VIDEO COLLECTION" text, there is some additional Publishing, Marketing and Copyright information which reads "SIDE ONE: ALL SONGS PUBLISHED BY GALLO EXCEPT 7 PUBLISHED BY WB. SIDE TWO: ALL SONGS PUBLISHED BY GALLO EXCEPT 1,5 PUBLISHED BY WB. 3 PUBLISHED BY GALLO/UNITED LION MSC DIR. 4 PUBLISHED BY SCREEN GEMS EMI MSC DIR. (P) (C) 1991 WEA INTERNATIONAL INC. THE COPYRIGHT IN THIS SOUND RECORDING AND ARTWORK IS OWNED BY WEA INTERNATIONAL INC. A TIME WARNER COMPANY. MARKETED & DISTRIBUTED BY TUSK MUSIC CO. (PTY) LTD. ALSO AVAILABLE ON CD: WBCD 1720. All rights of the producer and of the owner of the work reproduced reserved. Copying, public performance, broadcasting and hiring out directly or indirectly of this cassette is prohibited". 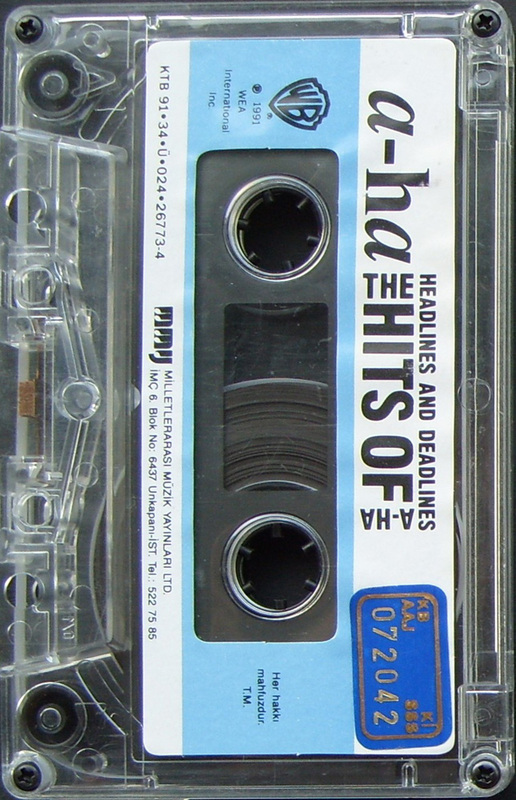 The tape itself is white with purple printed text, the title "HEADLINES AND DEADLINES A-HA" and "(P) 1991 Wea International" is shown at the top and the Copyright information is displayed at the bottom, the Catalogue number and "A.S.A.M.I SEAL OF APPROVAL" Musical Note symbol are also included. There is a Taiwan Release of "Headlines and Deadlines" which comes with a red and yellow fire design obi-strip which covers the whole of the back of the case. 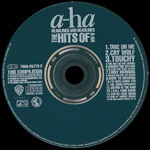 The obi includes coloured text, blue stars with "The very best" in yellow plus the track listing. 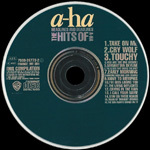 The disc itself is dark green with white text. It comes with the usual insert booklet, but all of the text is in white rather than a combination of white and colours, as is the title on the front sleeve. 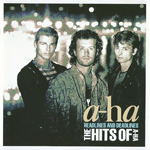 This release also comes with a large double-sided white folded paper sheet which has the lyrics in English, some other Taiwanese text about the band, plus three black and white shots of a-ha. 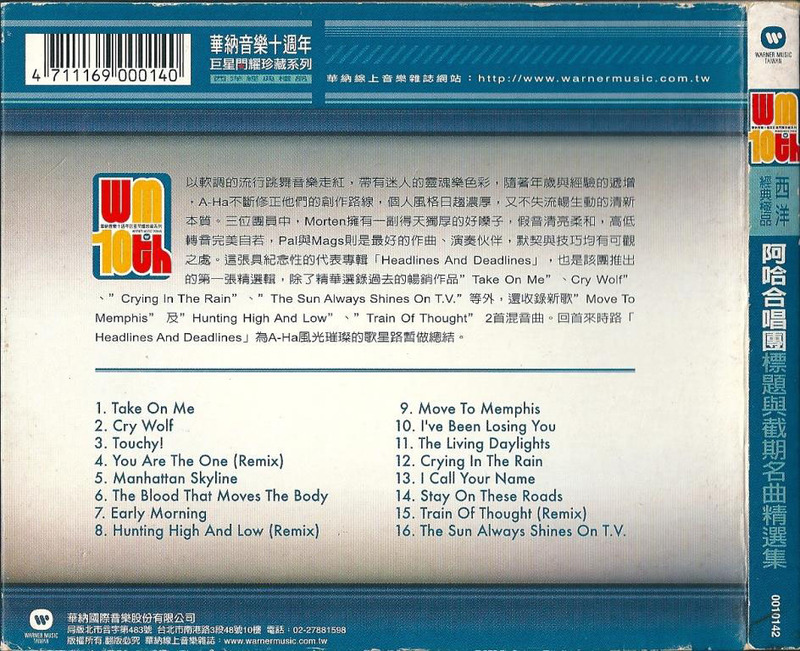 Although the catalogue number is the same as the EU release, the back cover indicates that the CD was made in Taiwan by UFO Group under licence from WEA International inc. 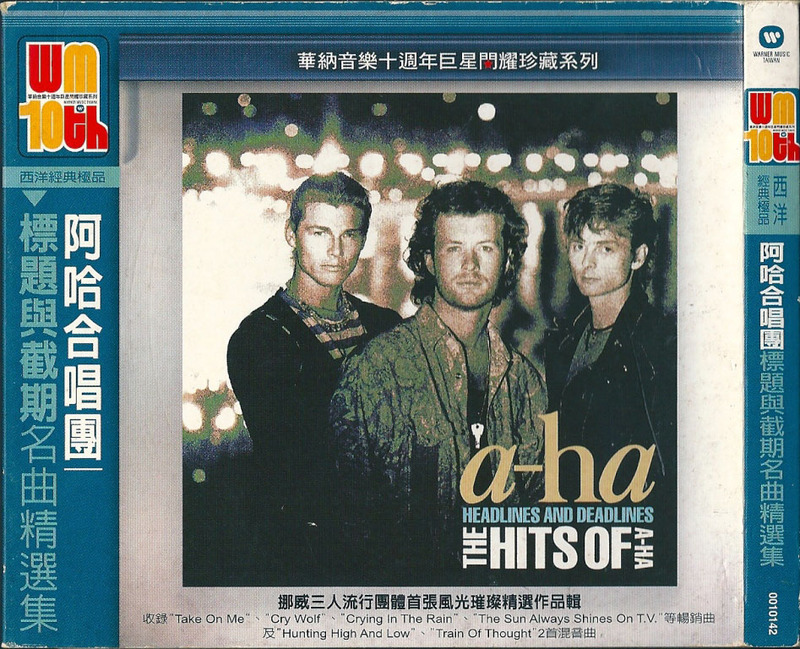 There is a Taiwan slip-case edition of Headlines And Deadlines which was Manufactured in Taiwan and released under the Warner Music 10th Anniversary collection series. The cover is grey and white with a thick blue stripe along the top and down the left hand side. A picture of the regular album cover is displayed in the centre. 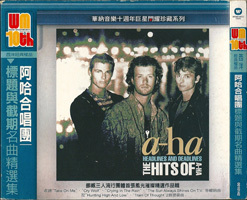 On the left hand side of the front cover is a-ha in white and the title "Headlines And Deadlines" in grey, both are shown in Taiwanese. 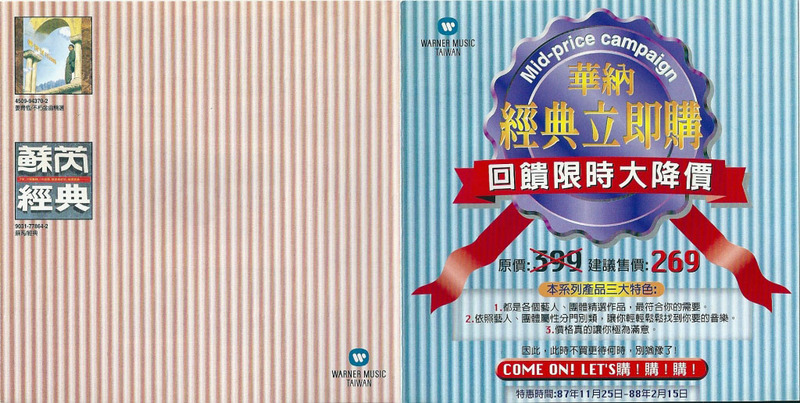 Along the top above the album artwork picture is a dark blue stripe which displays the Taiwanese information in white "Warner Music 10th anniversary collection series". 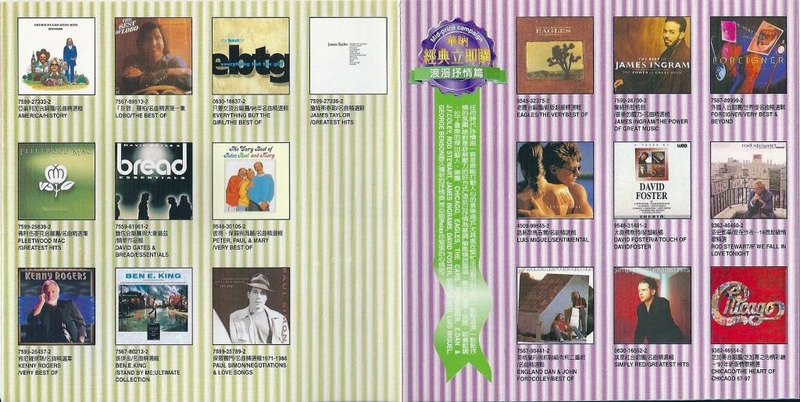 Along the bottom is some further Taiwanese text printed in black which refers to "Norway trio pop group best selection including:- Take On Me, Cry Wolf, Crying In The Rain, The Sun Always Shines On T.V., Hunting High And Low and Train of Thought Remix". There is a red and yellow "Warner Music 10th Anniversary" logo in the top left hand corner. 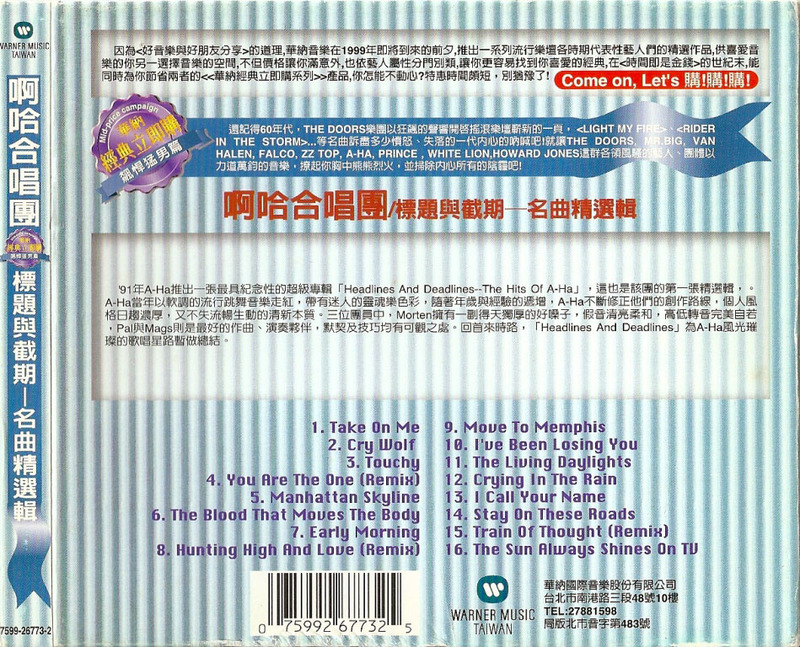 On the back cover there is some further Taiwanese text, along with a white barcode at the top and the full track listing in blue at the bottom. On the spine, there is an additional Catalogue number which reads 0010142. The actual CD inside is exactly the same as the previous Taiwan CD release which comes with a dark green disc with white text, it again includes the usual insert booklet but all of the text is printed in white instead of the three colours. 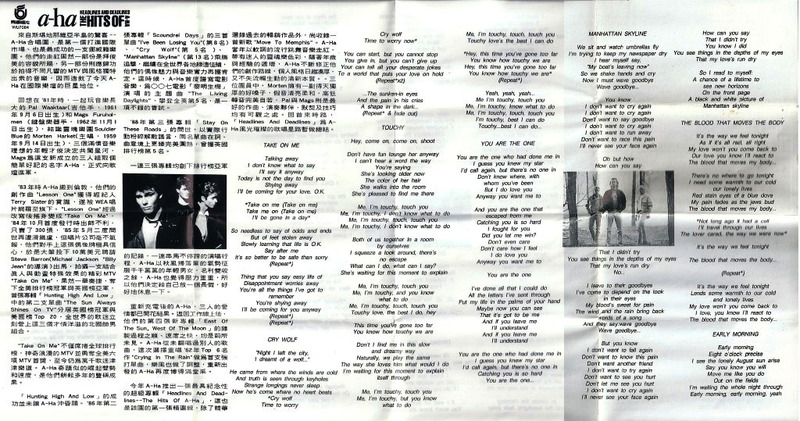 The large double-sided white folded sheet containing the lyrics in English, some Taiwanese text about the band and the three black and white shots of a-ha is also included inside. 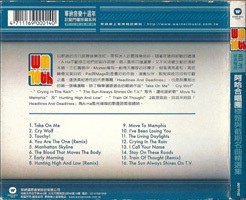 The back cover indicates that the CD was made in Taiwan by UFO Group under licence from WEA International inc. There is another slip-case CD edition which was again Manufactured in Taiwan and was released instead using the "Mid-price campaign" logo, it comes with a light blue, grey and white striped front and back cover. 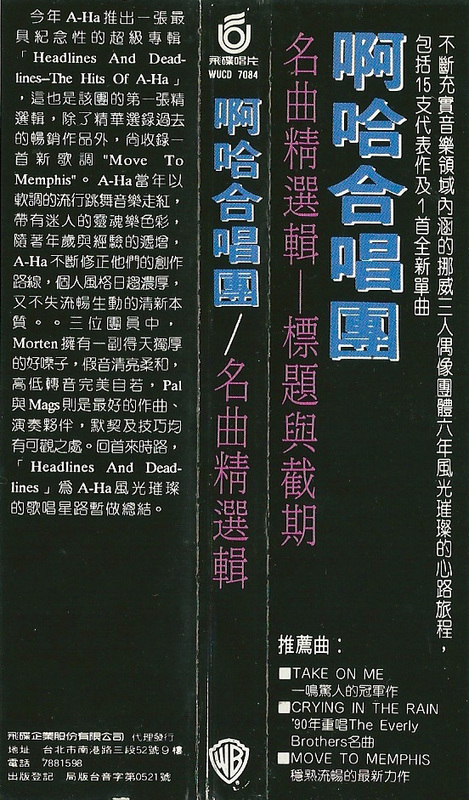 There is a printed purple rosette with a blue ribbon stretching along the top of the front cover including the title "Headlines and Deadlines" in white and printed in Taiwanese, the A-ha logo is again shown in Taiwanese down the right hand side. The regular album cover is displayed in the centre with the usual a-ha logo and title in English at the bottom right hand corner, it is shown all in white instead of the three usual colours. 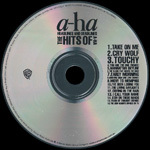 Along the top there is some additional Taiwanese information printed in purple, whilst on the left hand side of the front cover in black, it displays three tracks which appear on the album "Take On Me", "Crying In The Rain" and "Move To Memphis". On the back cover, the full track listing is shown in purple along with the Warner Music Taiwan logo, white barcode and Record Company contact information. The purple rosette with the blue ribbon is again displayed, but now includes a list of other artists including VAN HALEN, FALCO, ZZ TOP, PRINCE and HOWARD JONES which were also available in this "Mid-price campaign series". Near the top of the back cover is a red and white banner which carries the slogan "Come On, Let's Buy Buy Buy! ", the "Buy Buy Buy!" part has been printed in Taiwanese. 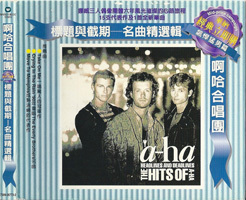 On the spine, the "Warner Music Taiwan" logo is displayed at the top with the A-ha logo and title "Headlines and Deadlines" again in Taiwanese, the purple rosette seperates the two. The European Catalogue number is shown at the bottom 7599-26773-2. The CD included inside is exactly the same as the one used on the previous Taiwan releases and includes the green disc with white text, usual insert booklet and large double-sided white folded lyric sheet. 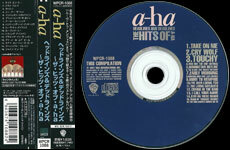 The CD was again made in Taiwan by UFO Group under licence from WEA International inc. 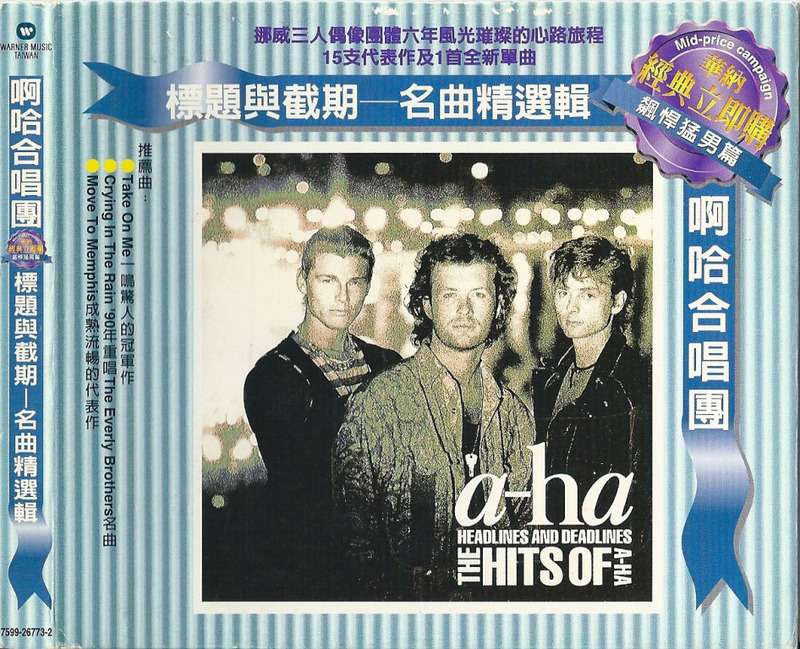 There is another Taiwan CD release which comes with a regular sized black obi-strip with blue, pink and white text, the European 7599-26773-2 WE 835 CD case was used and was Manufactured in Germany rather than Taiwan, but the actual disc itself was French made and comes with a Navy disc with silver text and the yellow a-ha logo at the top. The Catalogue number on the disc is 7599-26773-2 FRANCE :WE 391. The release also comes with the regular 6 page CD booklet and the text included is printed in the three different colours beige, blue and white. 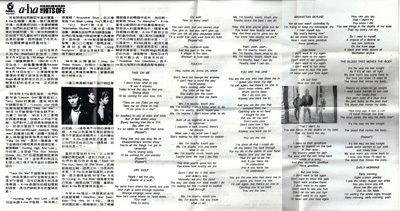 The usual large Taiwan double-sided white folded lyric sheet is also included. The Taiwan cassette release was "MADE BY UFO GROUP IN TAIWAN UNDER LICENSE" and comes with a similar folded insert to the European release, but all the text is printed in white instead of the three usual colours. On the inside of the folded insert on side 2, there is some additional Manufacturing and Copyright information which reads "Manufactured in TAIWAN under license from WEA International Inc. No license is granted or is to be implied by the sale or supply of this cassette or container thereof under or in relation to any trademark or copyright of or owned by WEA International Inc. anywhere in the world outside TAIWAN". 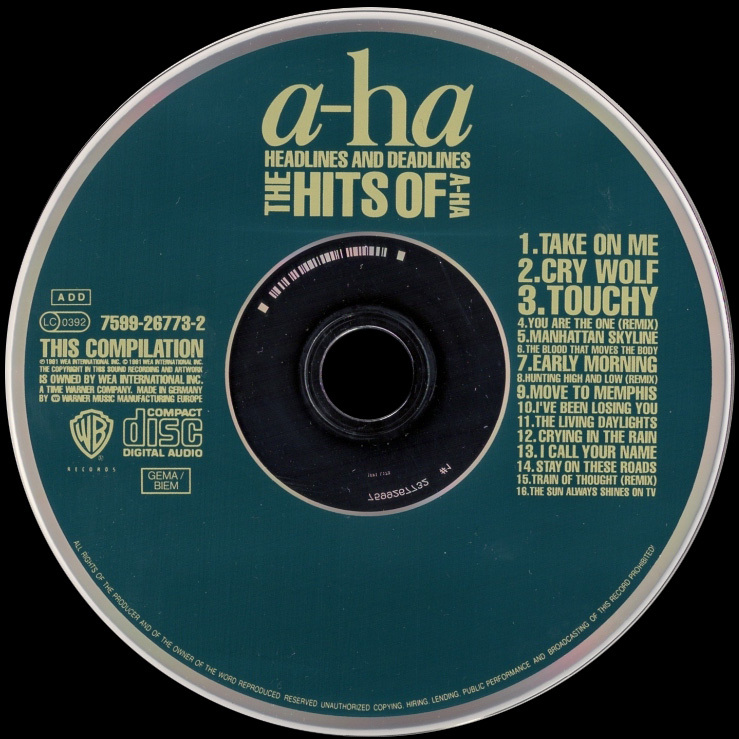 On the actual spine, the title "a-ha HEADLINES AND DEADLINES THE HITS OF A-HA" is shown in the centre along with the three standard European Catalogue numbers at the bottom. The "WB Records" logo is also included. Displayed at the top is the Taiwan logo and Catalogue number WU7084. 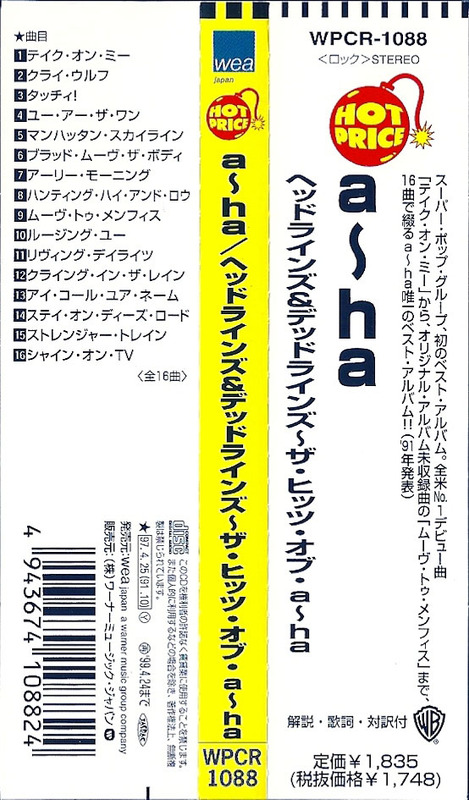 On the back cover underneath the barcode, the "UFO GROUP" Manufacturing information is also shown along with some other text printed in Taiwanese. 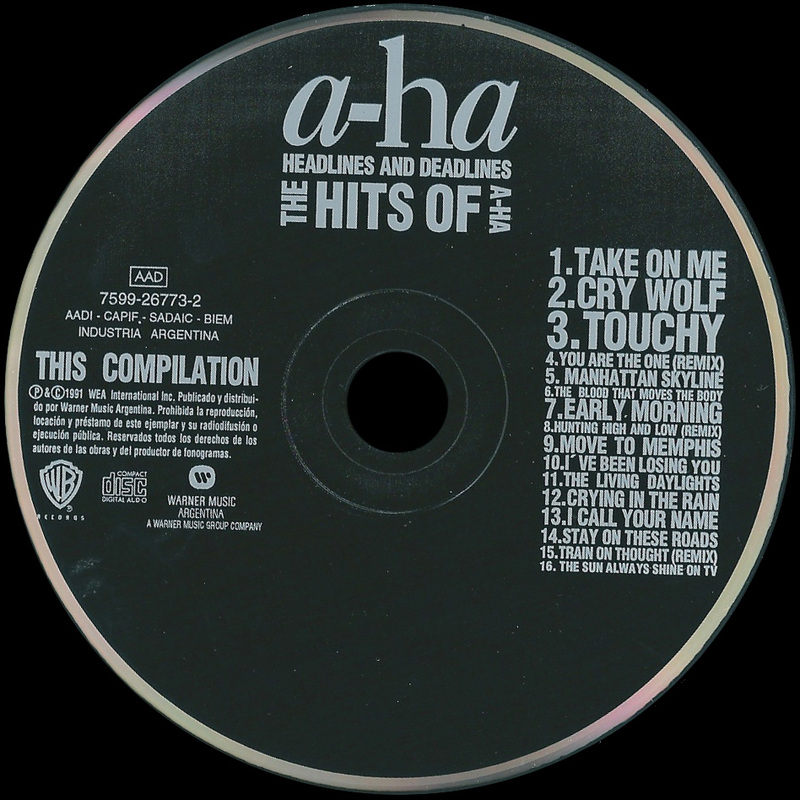 The tape is black with a black stick-on label and grey text, the title "A-HA HEADLINES AND DEADLINES THE HITS OF A-HA" is displayed at the top with the full track listing shown underneath. 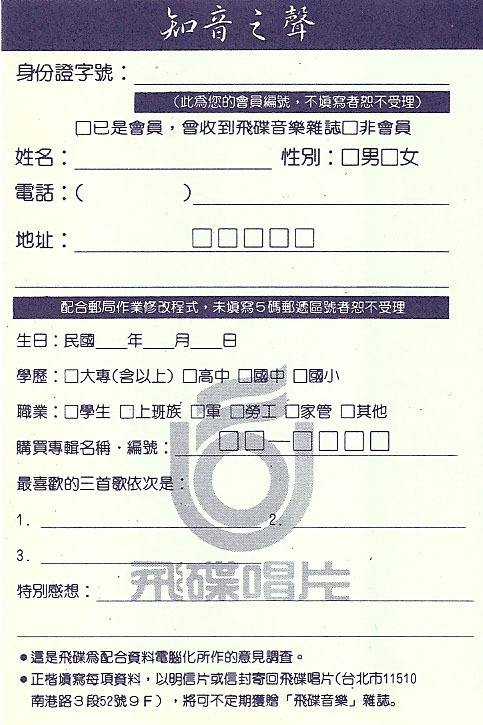 At the bottom it displays the Manufacturing information "MADE BY UFO GROUP IN TAIWAN UNDER LICENSE" along with some other Taiwanese text. On the left hand side of the tape, we have the Taiwan logo and Catalogue number WU7084, whilst on the right hand side, it displays the "WB Records" logo, "DOLBY SYSTEM" logo and European Catalogue number 7599-26773-4. 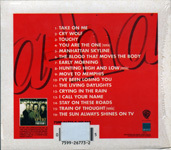 Additionally included inside the cassette is a pale green single-sided information card about the band, along with the usual large double-sided white folded lyric sheet which has the lyrics printed in English, some other Taiwanese text about the band and the three black and white shots of a-ha. The "UFO GROUP CO., LTD" text and Taiwan logo has additionally been engraved onto the back of the plastic cassette case. The Thailand cassette release comes with virtually the same fold-out insert as the European edition displaying the regular front and back cover artworks. The catalogue numbers displayed on the actual spine and back cover next to the white barcode are the same as the German made European edition; "WX450 C" and "7599-26773-4 Ⓤ", but the FRANCE number reads "FRANCE WE391" instead of "FRANCE WE491". There are at least three different issues and pressings to this Thailand release. The first pressing comes with a small white rectangular sticker on the front of the cassette case showing the "Warner Music" logo in blue, with the text; "WARNER MUSIC INTERNATIONAL" underneath in black. 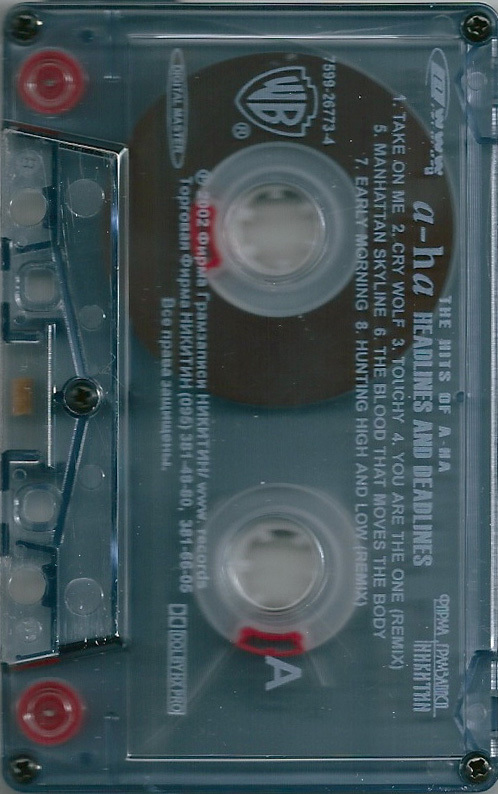 The tape itself is grey with black printed text and displays the revised title along the top; "A—HA/HEADLINES & DEADLINES THE BEST OF A—HA"" with the full track listing to each side underneath. On the left hand side, there is a small "1" or "2" whilst on the right, the "WB"" logo, and shorted Catalogue number 26773-4", plus "DOLBY HX PRO" symbol are shown. Along the bottom of side 1, it displays the text; "See inlay card for Producer credits". Whilst along the bottom of side 2, there is instead some "WEA International Inc." Record Company and Copyright information; "This compilation: ℗ © 1991 WEA International Inc. All rights reserved. Unauthorized duplication, public performance and broadcasting if this recording is forbidden". Additionally engraved into the top right hand corner of the tape on both sides is the word "JAPAN", plus engraved onto the back of the actual cassette case is the "WARNER MUSIC INTERNATIONAL" logo. The second and third pressings come with the same fold-out insert as the first release, but both copies include a slightly different variation to the Record Company logo/Price stickers on the front of the cassette cases. 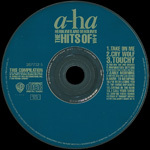 One copy comes with a "MGA Records Co Ltd / Warner Music International" black, blue and white sticker, with a price tag of "90 Thai Baht" and some other Thai text along the bottom, whilst another "MGA Records Co Ltd" edition is instead mainly light blue, rather than the previously black, and comes with a different layout and design to show most of the text in Thai along the top and the "MGA Records Co Ltd" logo along the bottom. A smaller blue "Warner Music International" logo and blue "90 Thai Baht" price tag are included in the middle. The actual tape included on the second & third pressings is now tranparent clear with a grey centre piece and white printed text, the layout and design including the font size of the text is however the same as the earlier grey coloured cassette, but the wording "JAPAN" hasn’t been engraved onto the actual tape though. The Catalogue number on the cassette is also the same as before and has been shorted to "26773-4". 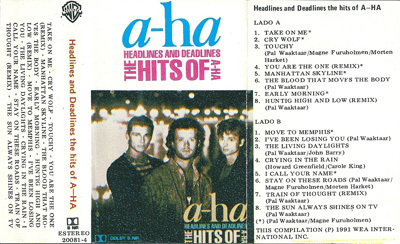 The Turkish cassette has a similar folded insert to the European release but the colouring on the title "HEADLINES AND DEADLINES" has been printed in a slightly darker blue, it also doesn't include the word "Records" underneath the "Warner Brothers" logo at the top of the spine, the Catalogue number at the bottom has also been changed to 26773-4. 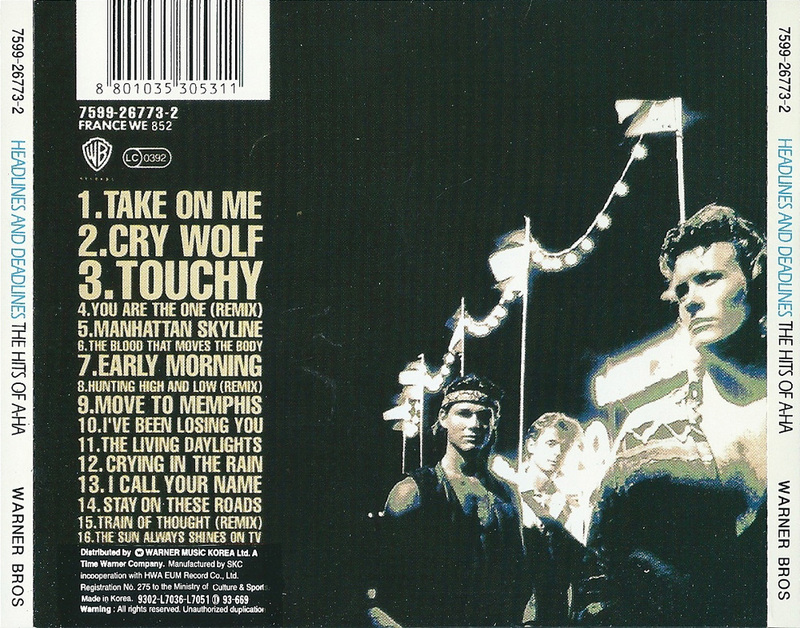 The size of the back cover is also smaller and the layout is different with the track listing for each side being displayed landscaped from one end to the other, there is no barcode included. Along the bottom of the back cover under the track listing is some Production and Copyright information which reads "(P) & © 1991 WEA International Inc. WEA International Inc. Lisansi ile, MMY Ltd. Tarafindan yayinlanmistir", there is also a Record Company contact address:- "MMY Milletlerarasi Muzik Yayinlari Ltd. I.M.C. 6. Blok No. 6437 Unkapani/Istanbul Telefon:. 522 75 85". There are two slightly different pressings; the first pressing comes with a dark tinted tape with a dark blue and white stick-on label. The title "a-ha HEADLINES AND DEADLINES THE HITS OF A-HA" is printed in black at the top and displayed along the same lines as on the front cover. 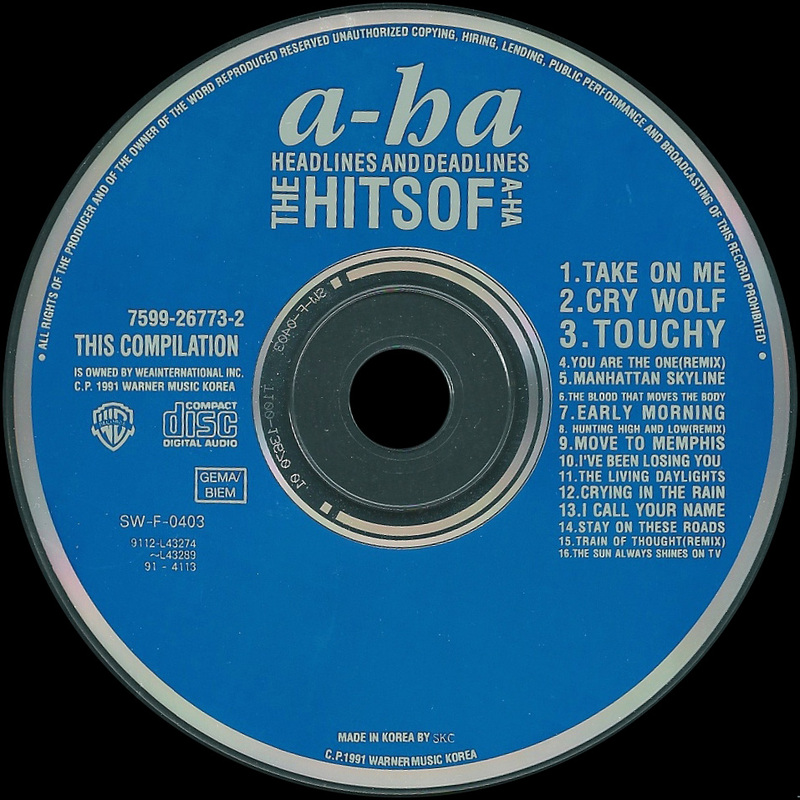 There is a small yellow rectangular sticker at the top right hand corner of side 1 displaying "KTB KEG 90394 K" in gold/green text. On the left hand side we have the "WB" logo and some production text "(P) 1991 WEA International Inc.", whilst on the right hand side there is some Turkish all rights reserved trademark text "Her hakki mahfuzdur. T.M." At the bottom of the tape there is some Catalogue numbered coding which reads "KTB 91.34.U.024.26773-4", the same Record Company contact address information which appeared on the back cover is also additionally shown. The 2nd pressing comes instead with a transparent clear tape with a grey centre; the stick-on label is coloured light blue and white. The layout and design is otherwise exactly the same as the first pressing apart from the small rectangular sticker at the top right hand corner of side 1 is coloured navy with gold text and reads "KB AAJ 072042 KI SSS". The Catalogue number on both pressings is however exactly the same. The CD release was released under license to Warner Music International in Ukraine, it comes with a similar front and back cover to the European release. The usual three coloured European booklet is also included but additionally displays a small blue and yellow text box on the front cover showing "зроблено в украiнi" which translates to "Made in Ukraine". 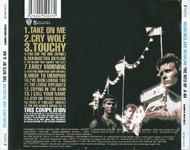 On the back cover, the white barcode at the top has been printed slightly smaller compared to the European release. The full track listing is also printed down the left hand side. The usual white European Manufacturing and Copyright information at the bottom left hand corner has been slightly amended to omit "Made in Germany", plus the Copyright part information has been completely removed, the full Manufacturing and Copyright information has now been displayed at the top alongside the barcode and is printed all in Russian, it reads "(P) 2008 Компания Одиссей - лицензиат Warner Music International на территории Украиньі. Все права защищены. Незаконное копирование, тиражирование, сдача в прокат и любое публичное использование запрещено и преследуется законом об авторских правах. По вопросам лицензирования обращаться email: [email protected] эксклюзивные права на распространение принадлежат «ОДиссей»: 65012, г. Одесса, ул. Осипова, 48, тел. : +38(050) 336-73-73. 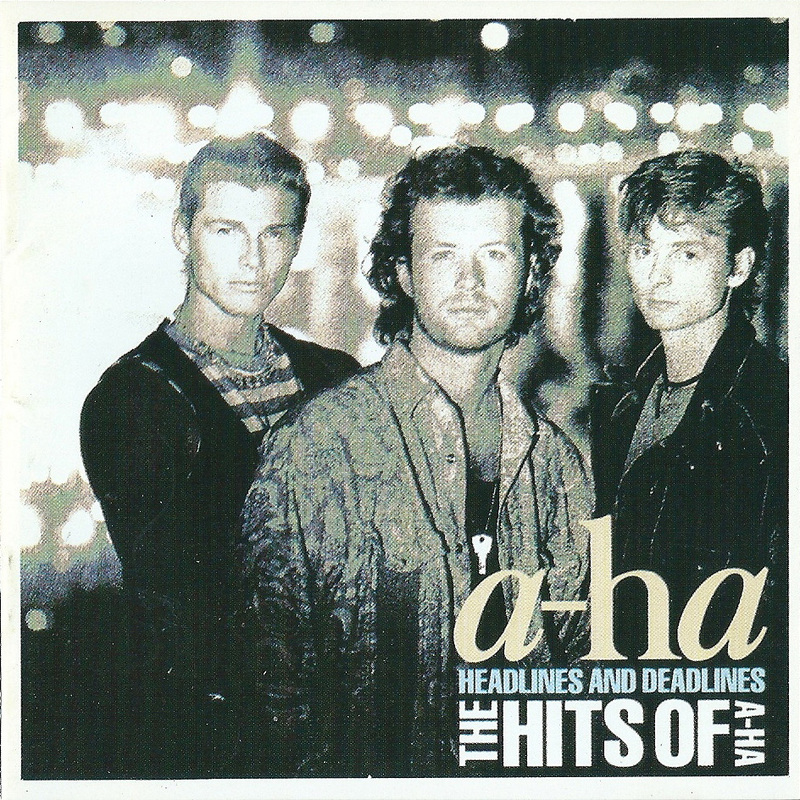 A-HA / Headlines And Deadlines, 1 аудио-сd. Качество гарантировано, 6 месяцев от даты приобретения Хранить при t: -10°/+30°C. не подлежит обязательной сертификации. Подробная информация на сайтах: www.odyssey.od.ua и www.planetahitov.com". 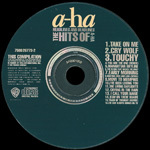 Also displayed on the back cover is the usual "Warner Brothers Records" Logo and the LC 0392 coding along with two additional "ODYSSEY" and "PLANET OF HITS www.planetahitov.com" logo's. A silver rectangular control mark "контрольна марка" hologram sticker is also included. The disc itself is navy with white printed text and comes with a large silver centre ring. Some slightly different Russian Manufacturing and Copyright information is displayed around the outer edge of the disc "(P) 2008 Компания Одиссей / Планета Хитов по эксклюзивной лицензии Warner Music Austria. Все права защищены. Незаконное копирование, тиражирование, сдача в прокат и любое публичное использование запрещено и преследуется законом об авторских правах. Отпечатано в Украине. www.odyssey.od.ua www.planetahitov.com". 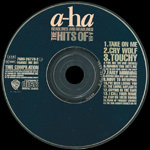 The "ODYSSEY" and "PLANET OF HITS www.planetahitov.com" logo's are again displayed additionally on the disc. 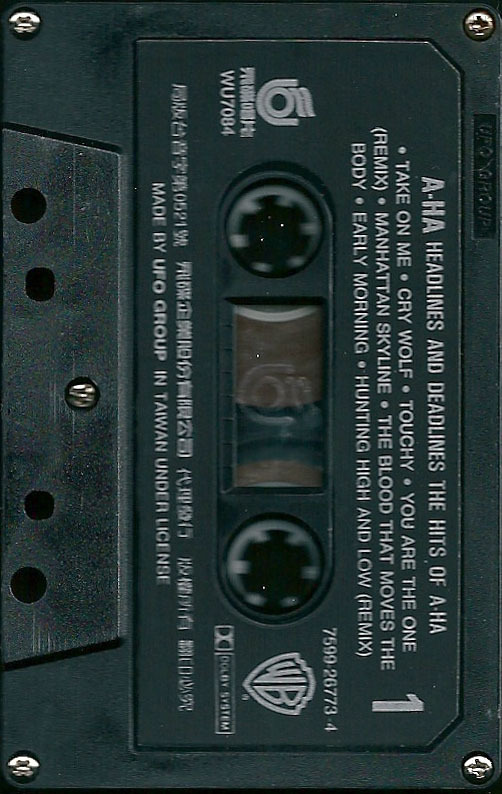 There is a Ukrainian cassette of "A-ha Headlines And Deadlines" which was released by "Никитин" under exclusive license to Warner Music. It comes with the same long fold-out insert displaying the regular front cover artworks as the Russian "Никитин" edition, but the actual layout of the spine and back sleeve differs slightly compared to the European release. 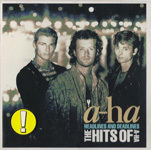 A silver "КОНТРОЛЬНА МАРКА" hologram sticker has also been included on the front cover with the text; "A-ha "Headlines & Deadlines- The Hits of" A 852768 БМ" printed in black. 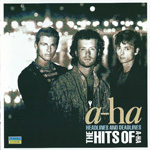 The spine comes with the title; "a-ha HEADLINES AND DEADLINES THE HITS OF A-HA" displayed landscaped in the centre, but in a slightly smaller font compared to the European edition. The standard Catalogue number 7599-26773-4 is printed orientated in white at the top, with a smaller white "WB" logo, plus "WWW RECORDS.RU" Website and "ФИРМА ГРАМЗАПИСИ НИКИТИН" at the bottom. On the back sleeve, the size and layout of the text is again slightly smaller, the regular full track listing is displayed at the top in cream (rather than beige), with the lower half showing some white Production & Copyright text, printed in both English and Russian; "THIS COMPILATION ℗ & © 1991 WEA INTERNATIONAL INC. ℗ 2002 ФИРМА ГРАМЗАПИСИ НИКИТИН / WWW.RECORDS ALL RIGHTS RESERVED. EMAIL: [email protected] ТЕЛ./ф. : (095) 310-10-76. эксклюзивной дистрибьютер MC, CD в россии/снг: торговая фирма НИКИТИН E-MAIL: [email protected] ТЕЛ./ф. : (095) 381-66-05". Also included at the bottom of the back sleeve is a white barcode "0 75992 67734 9", "LC 0392" coding and "WB" logo. The inside of the folded insert is slightly shorter than the European release, it again folds out to contain the regular colour artwork pictures for each single on one side, with the black and white pictures, usual full track listings & credits printed in white on the other. The actual tape is transparent clear with white printed text and differs to the Russian "Никитин" release, it was instead Manufactured by "EURO STAR" in the Ukraine. Along the top it includes the title; "a-ha HEADLINES AND DEADLINES THE HITS OF A-HA" using the same layout as on the front cover. The full track listing has been printed in smaller text down the centre of each side, in-between the cogs. The Russian "WWW RECORDS RU" website address is displayed at the top left-hand corner of each side, along with the Ukrainian text "ФИРМА ГРАМЗАПИСИ НИКИТИН" at the top right. The shortened Catalogue number 926773-4, SIDE 1/2, "DOLBY HX PRO" and "DIGITAL MASTER" are included on the left, with the "EURO STAR" and a rounded leafed logo on the right. Along the bottom of each side is some Ukrainian Manufacturing and Copyright text, which includes some e-mail contact addresses; "℗ 2002 ФИРМА ГРАМЗАПИСИ "НИКИТИН" ВСІ ПРАВА ДОТРИМАНО НЕСАНКЦЮВАНЕ КОПІЮВАННЯ ТА ПУБЛІЧНА ТРАНСЛЯЦІЯ ЗАБОРОНЕНІ ВИРОБЛЕНО В УКРАІНІ КОМПАНІЄЮ "КИЇВ-ЄВРОСТАР" ПО ЛІЦЕНЗЇ ФИРМА ГРАМЗАПИС НИКИТИНУ "НИКИТИН" WWW.EUROSTAR.KIEV.UA EMAIL [email protected] kiev.ua [email protected]". 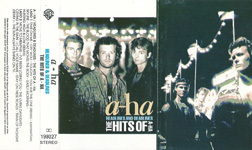 The cassette release comes with a single sided white folded insert with the a-ha logo displayed at the top in light blue and "HEADLINES AND DEADLINES THE HITS OF A-HA" in pink, the regular artwork is placed at the bottom half of the front sleeve with the "DOLBY B NR" logo at the bottom left hand corner. On the spine, the title "Headlines and Deadlines the hits of A-HA" is shown in red. along with the usual "WB", "DOLBY B NR" and "ESTEREO" logo's which are displayed in black along with the Catalogue number 20081-4. On the back cover the full track listing is also shown in black. On the right hand side of the folded insert, we again have the full track listing to each side along with track credits. At the bottom there is some Record Company information which reads "THIS COMPILATION (P) 1991 WEA INTERNATIONAL INC". 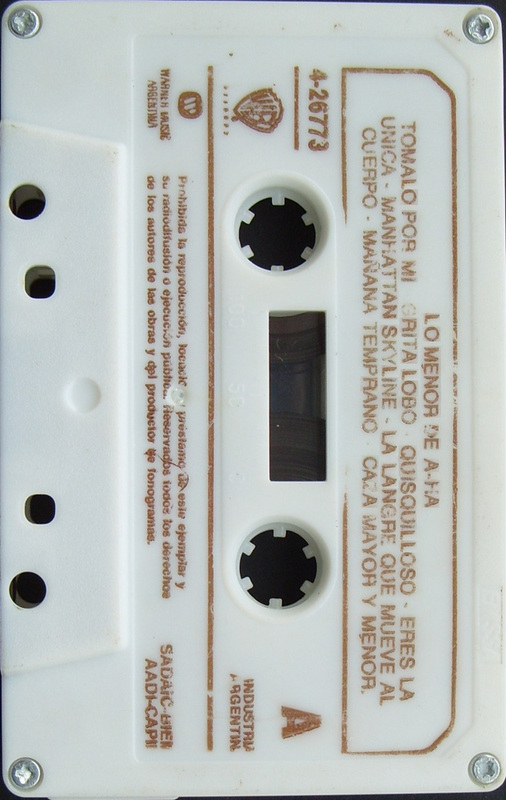 The tape itself is white with a light green stick-on label and black text, it comes with the title and track listing displayed at the top and some Spanish Copyright and "DOLBY" information at the bottom which reads "Reservados todos los derechos del productor fonografico y de los autores de las obras registradas en esta cinta prohibida su reproduccion, ejecucion publica y/o radio-teledifusion. Industria Uruguaya (Made in Uruguay) "Dolby" y el simbolo doble-D son marcas registradas de Dolby Laboratories Licensing Corporation. Bajo licencia RCA. Productor Fonografico WEL S.A. Fonograma es Cultura. Art. 79. Ley 13349". Also displayed is the "WB", "AGADU", "STEREO" and "DOLBY B NR" logo's, along with the Catalogue number which is also included. Brazil Videolar - 3rd press Headlines And Deadlines 759926773-2 / AO0001000 / AP0001000 / AR0001000 / AT0001000 / AU0001000 / AW0003000 / AY0001000 / AZ0004000.